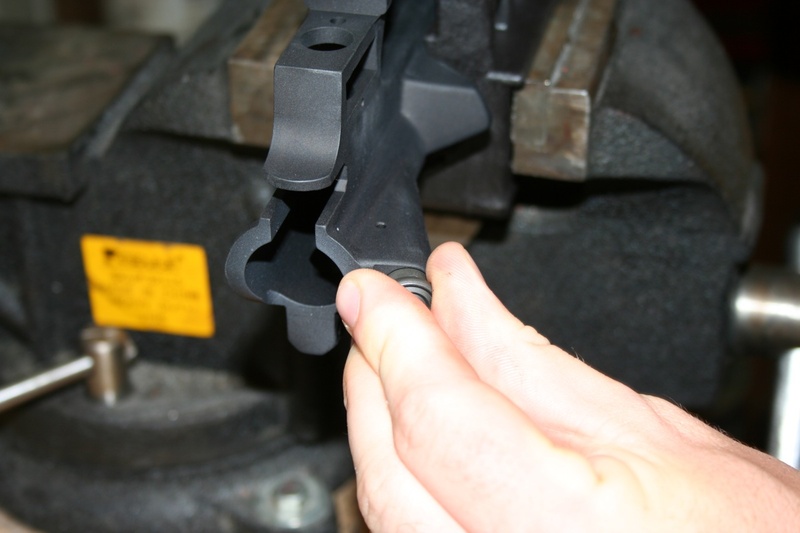 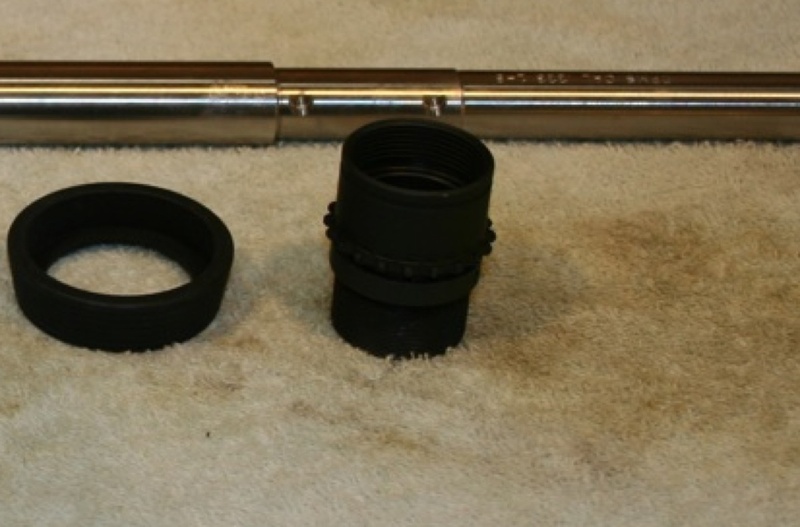 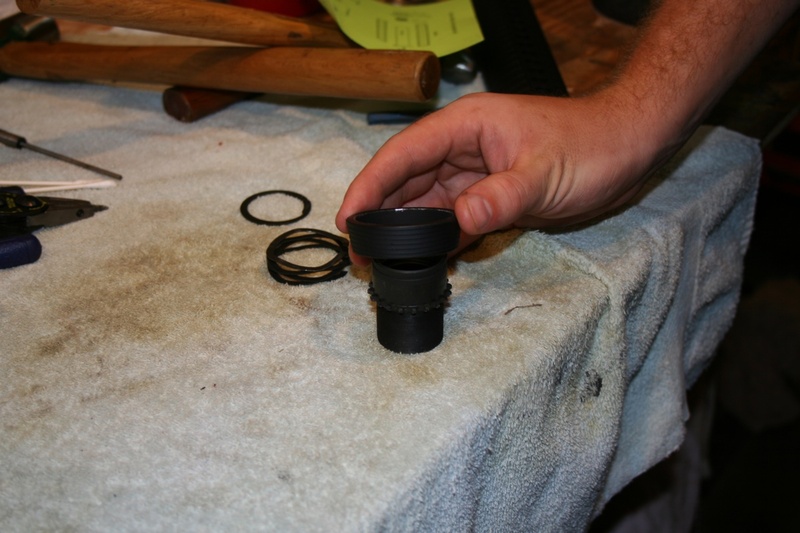 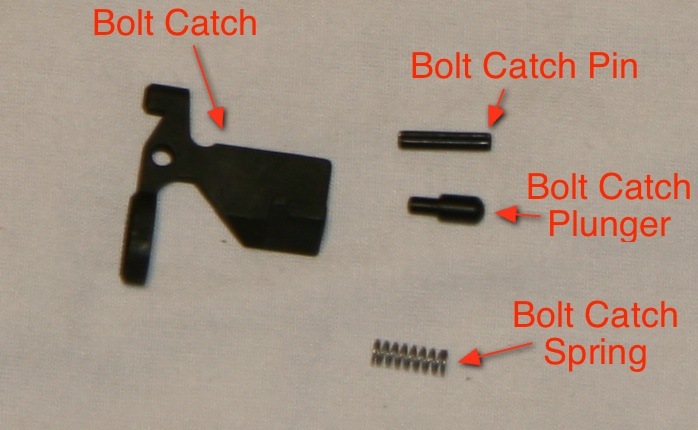 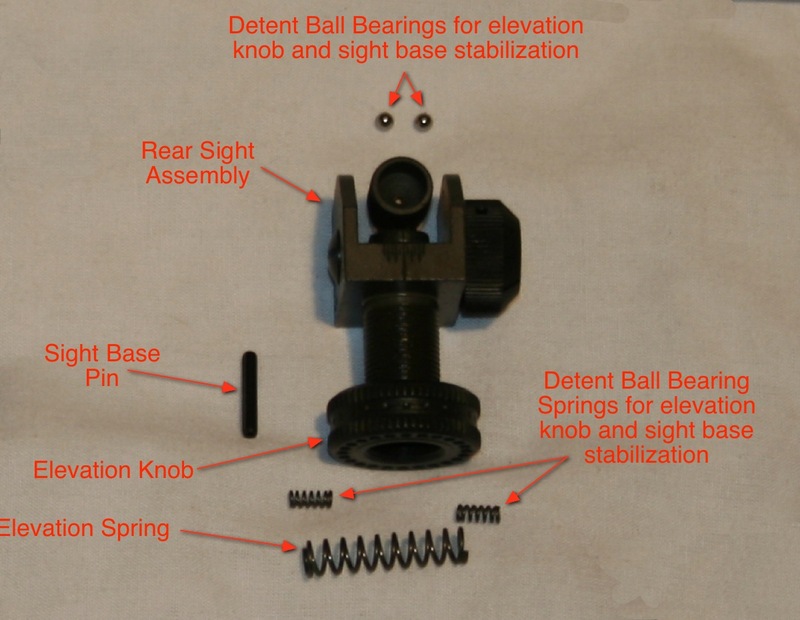 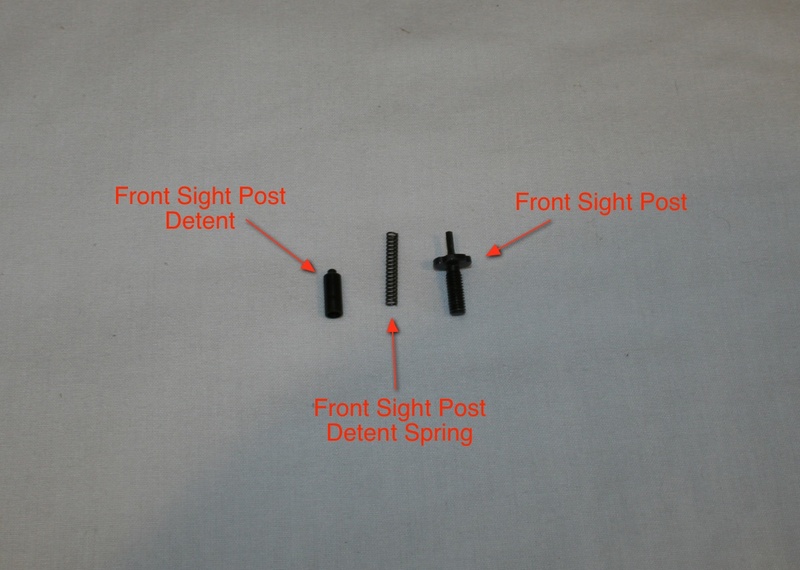 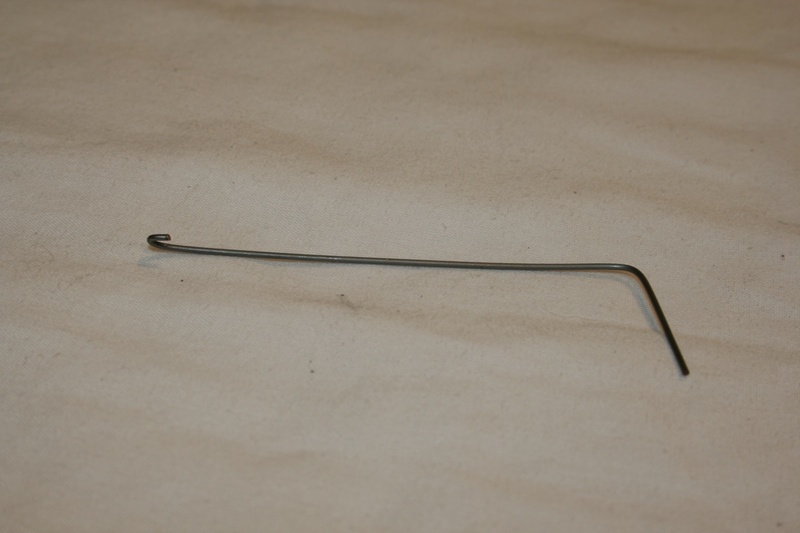 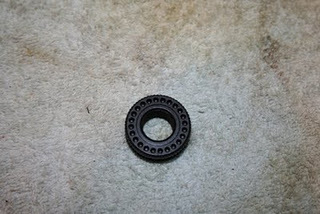 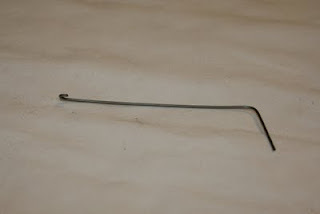 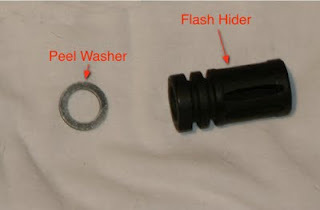 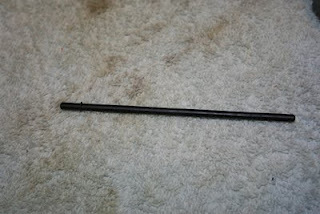 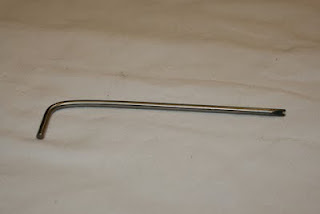 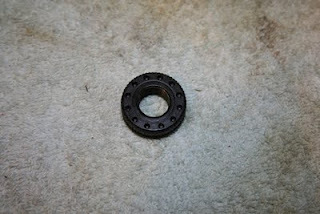 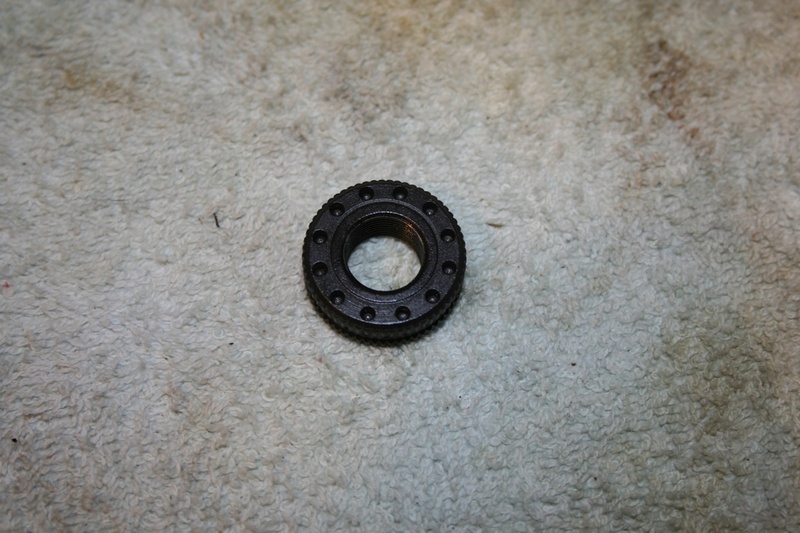 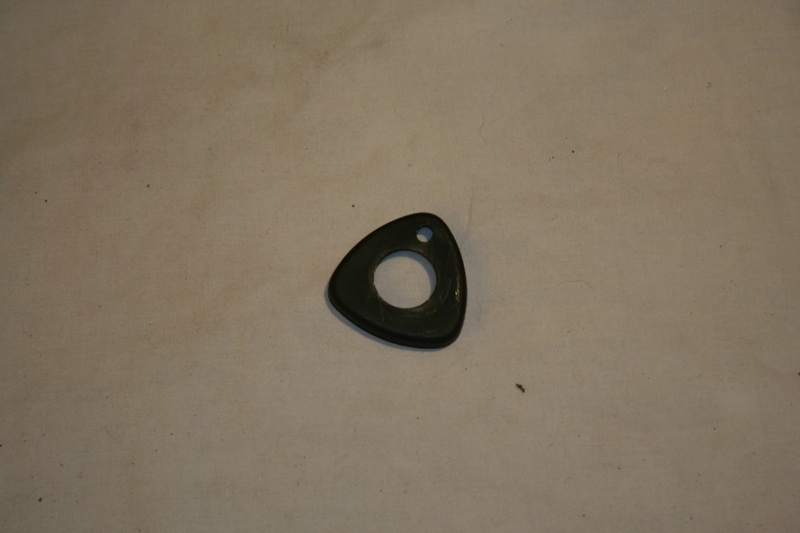 The magazine catch consists of three components, the catch itself, the spring and the button. 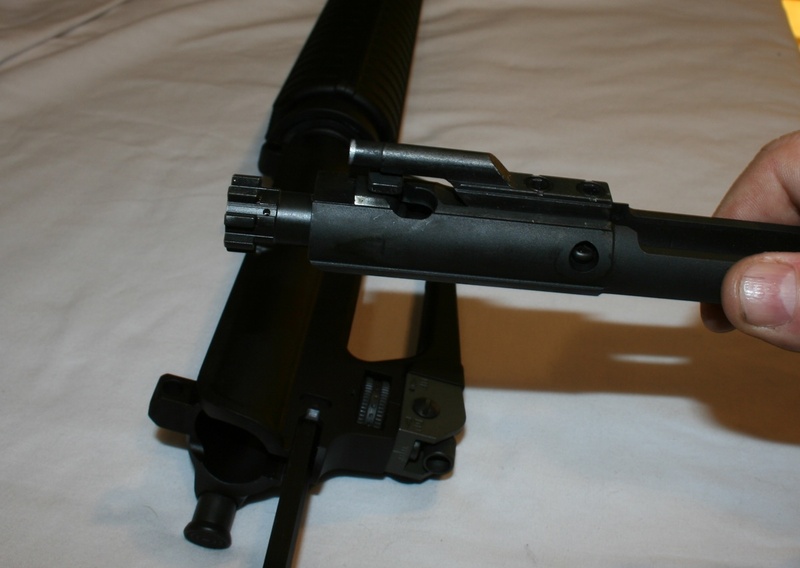 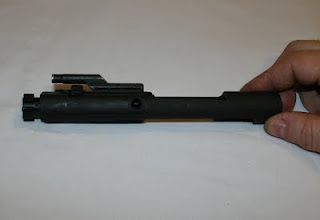 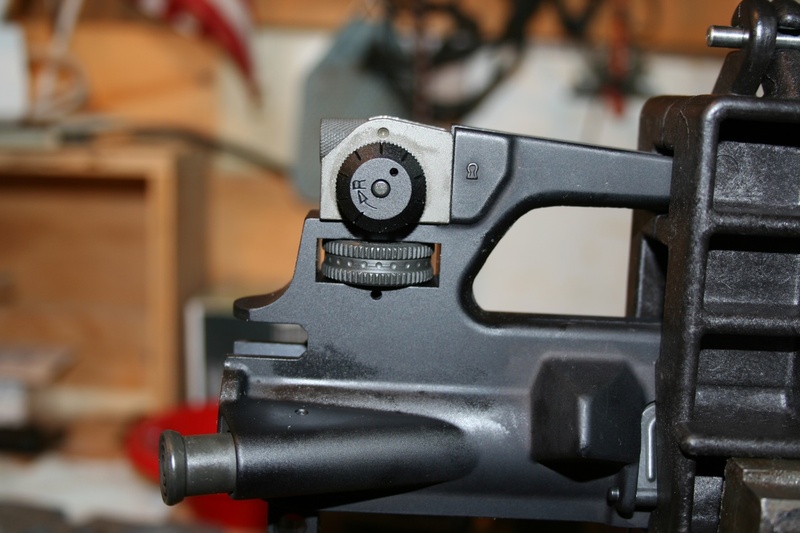 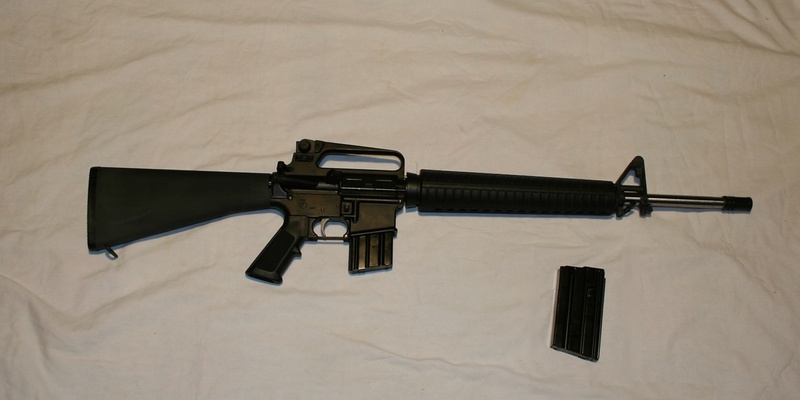 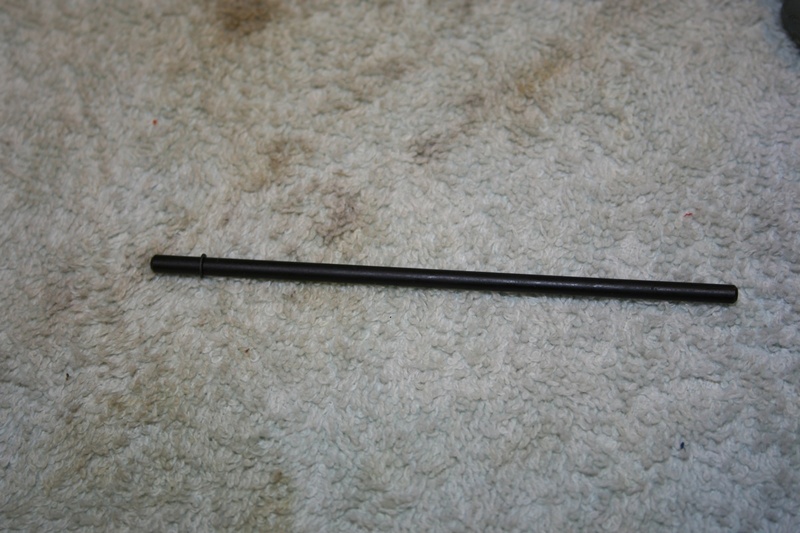 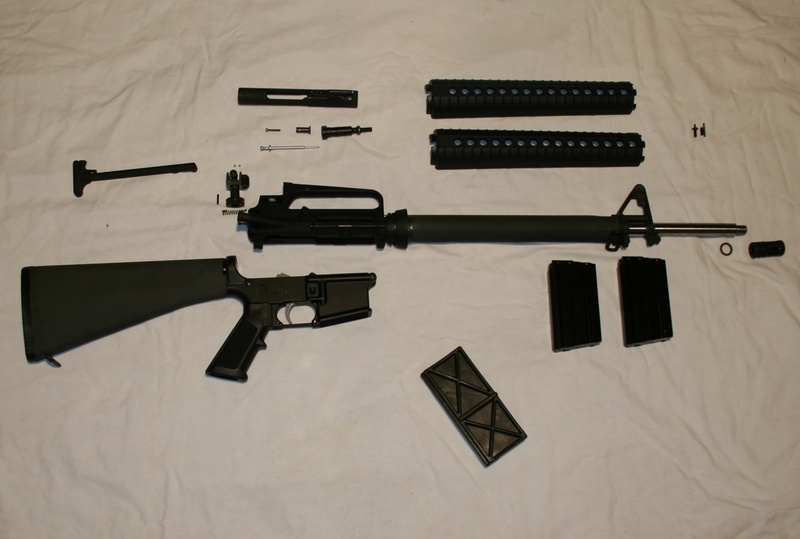 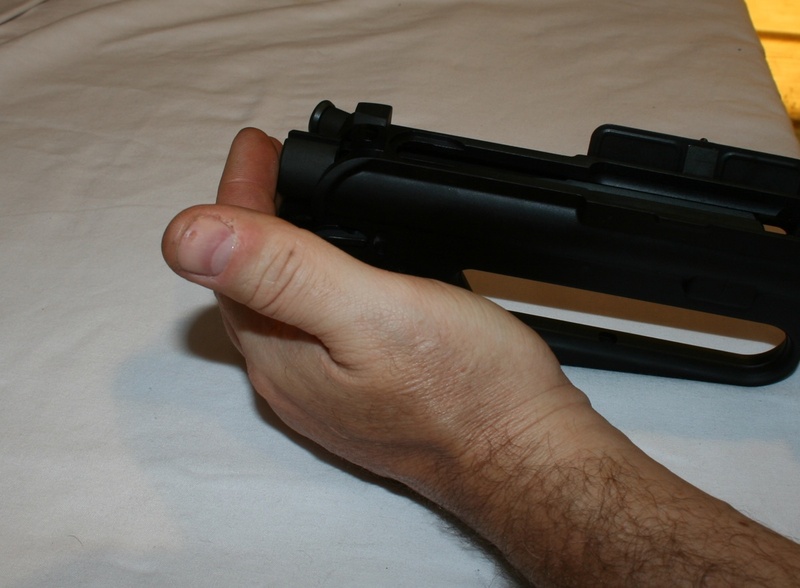 From the left side of the lower receiver, place the magazine catch into its well. 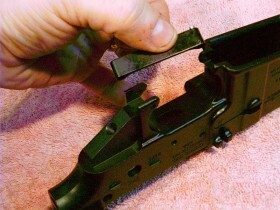 It should fit flush against the side of the receiver. 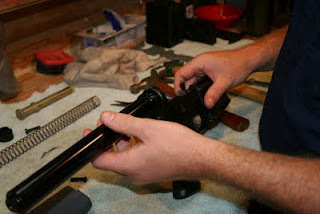 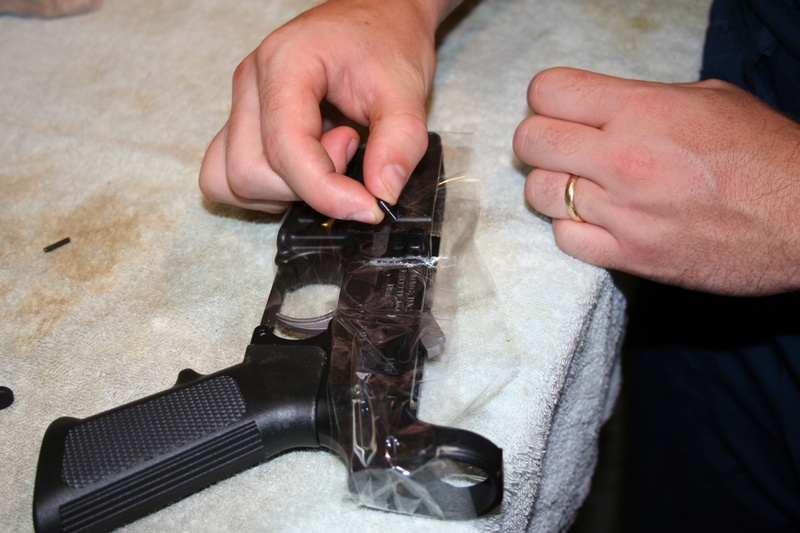 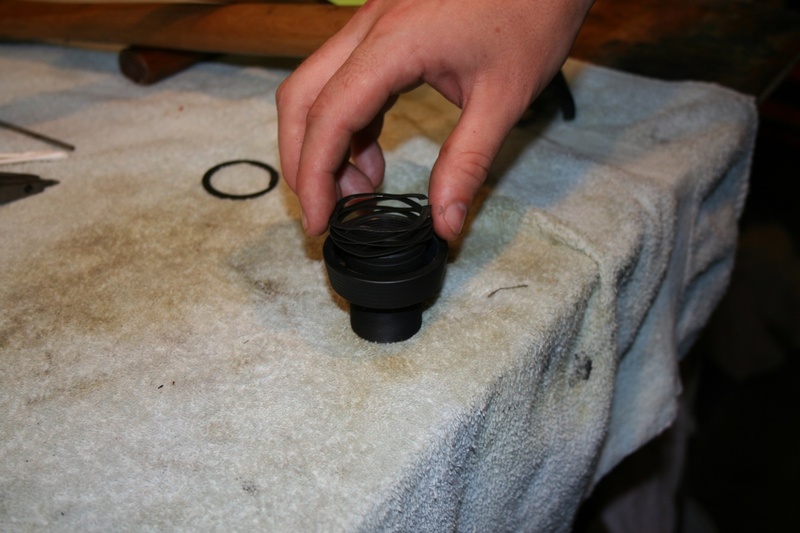 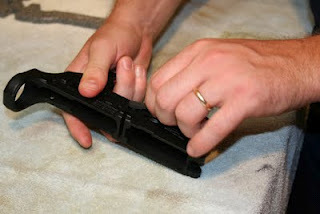 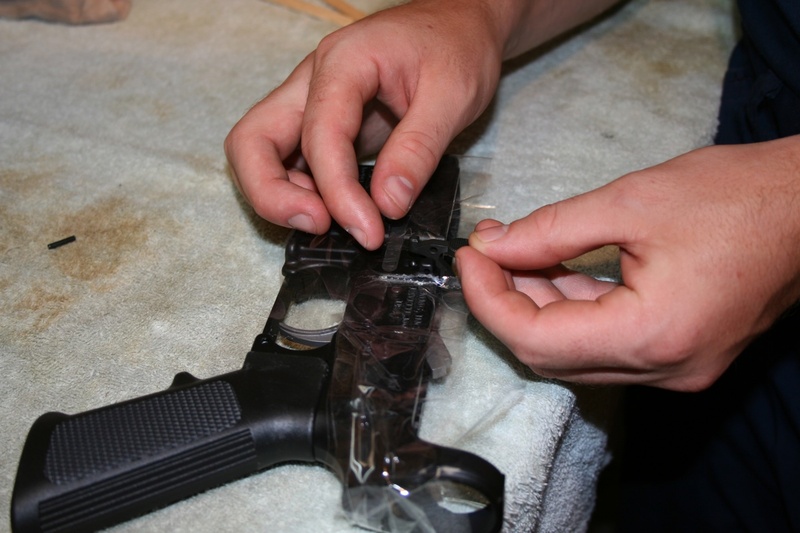 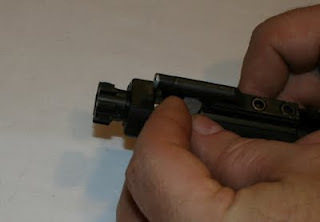 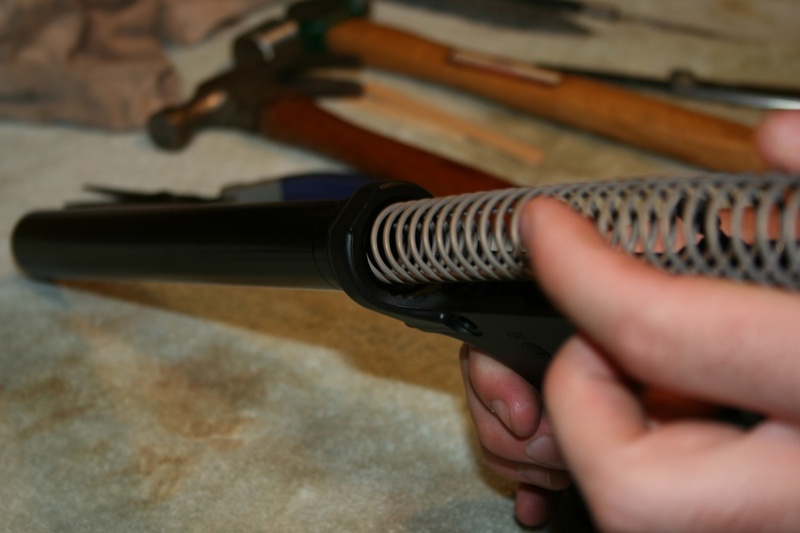 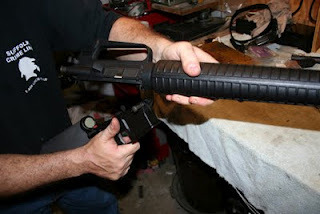 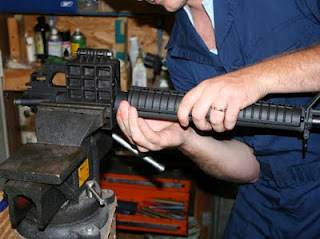 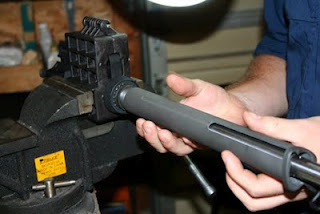 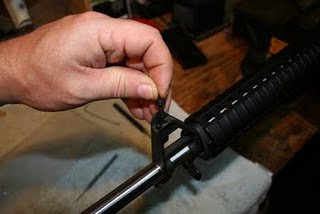 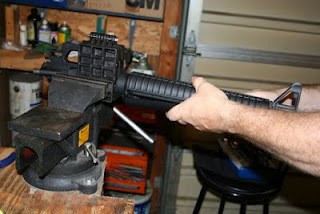 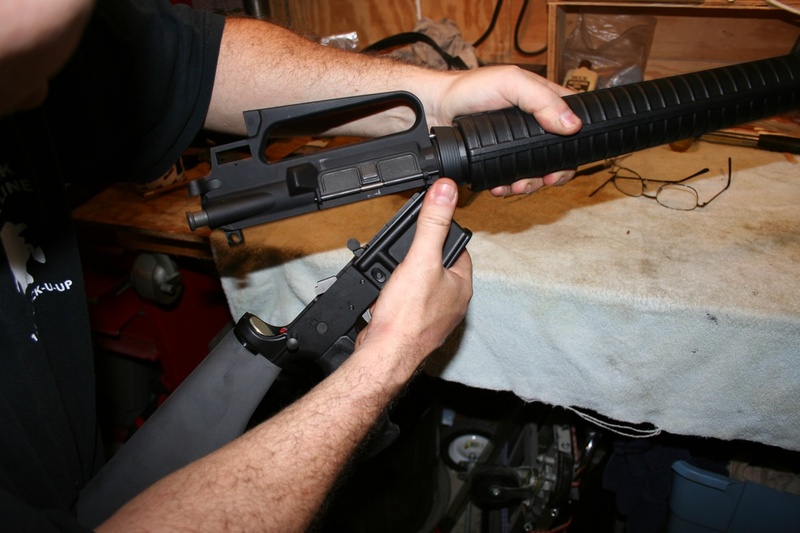 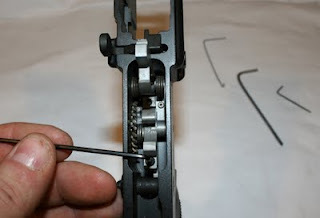 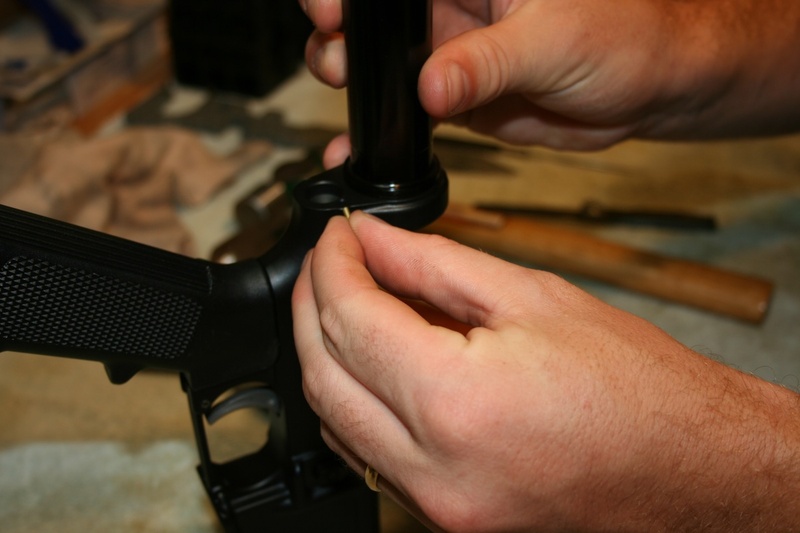 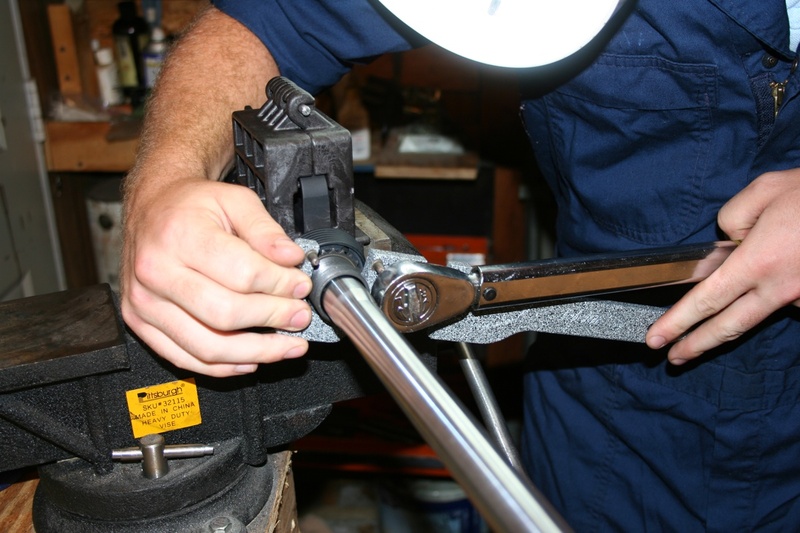 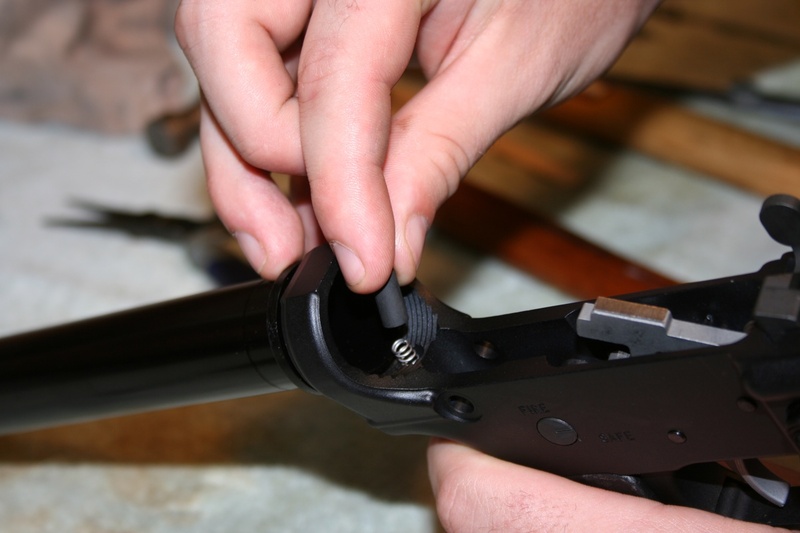 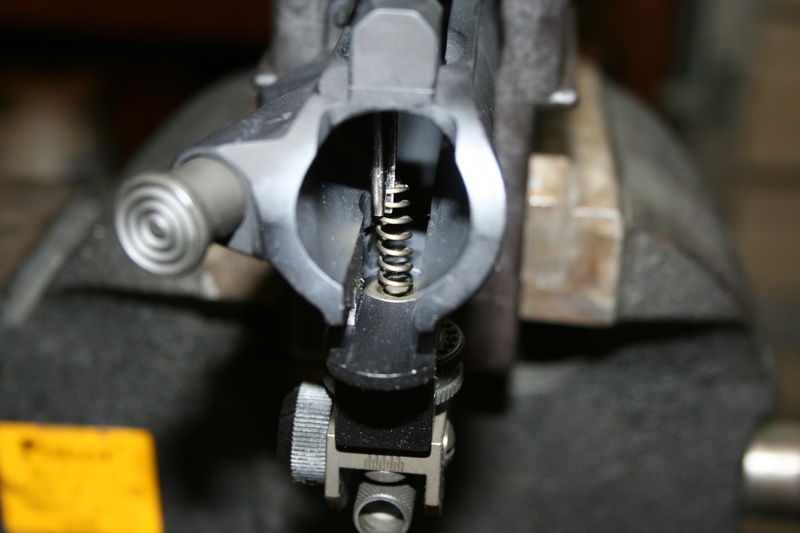 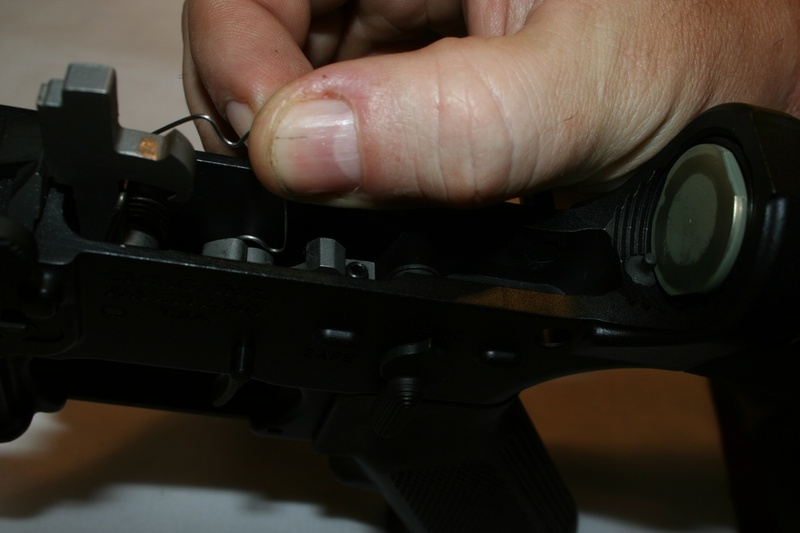 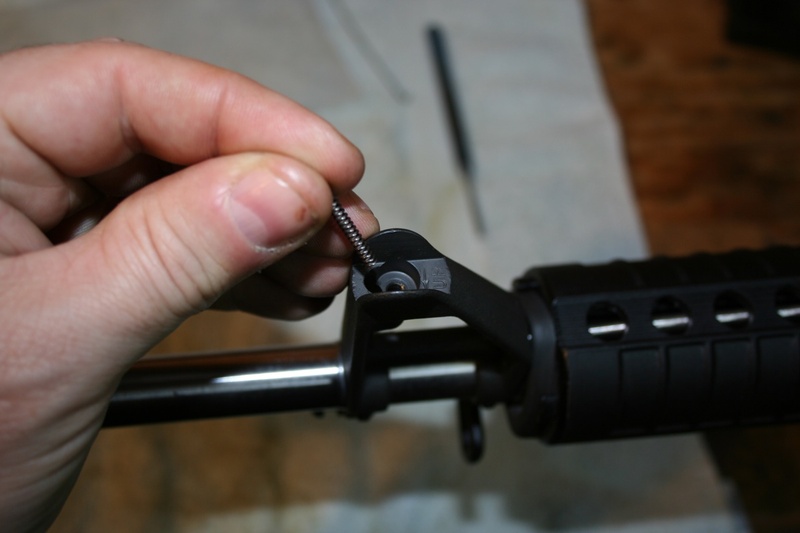 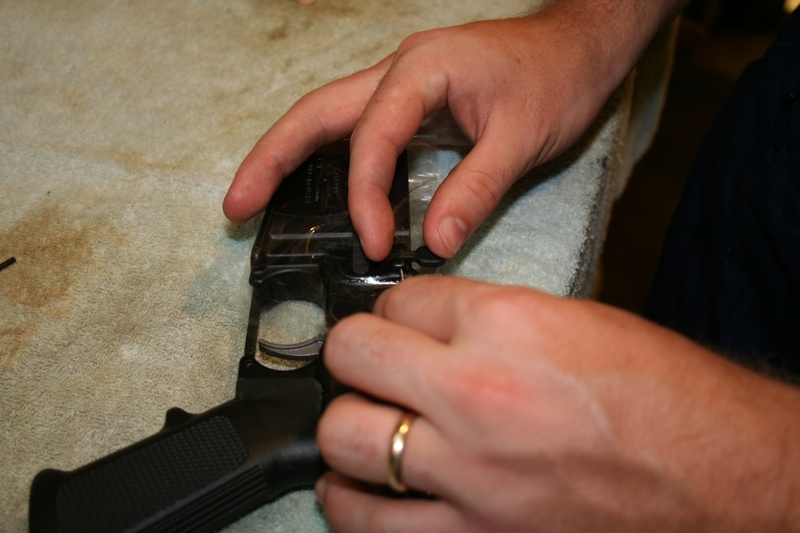 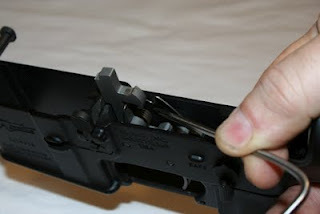 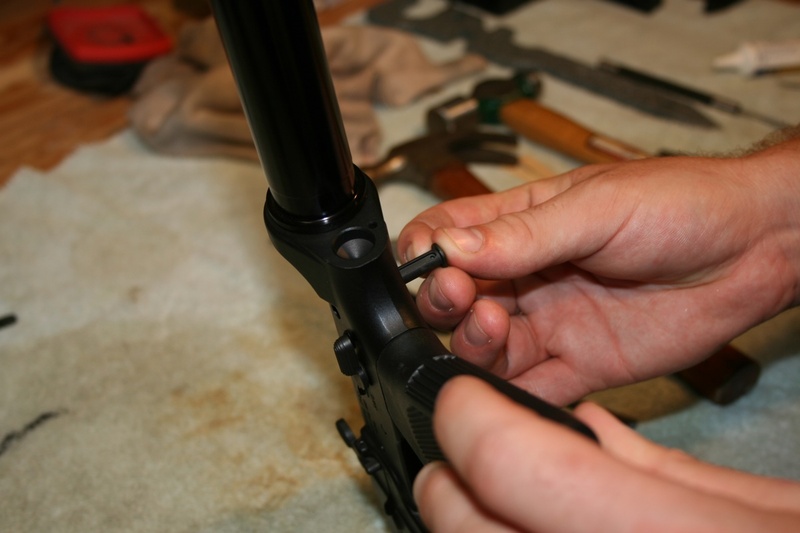 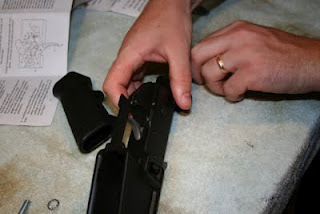 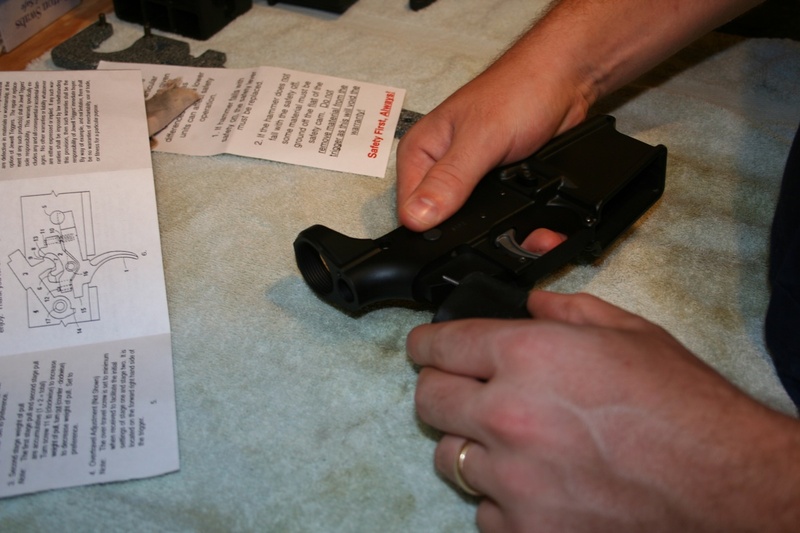 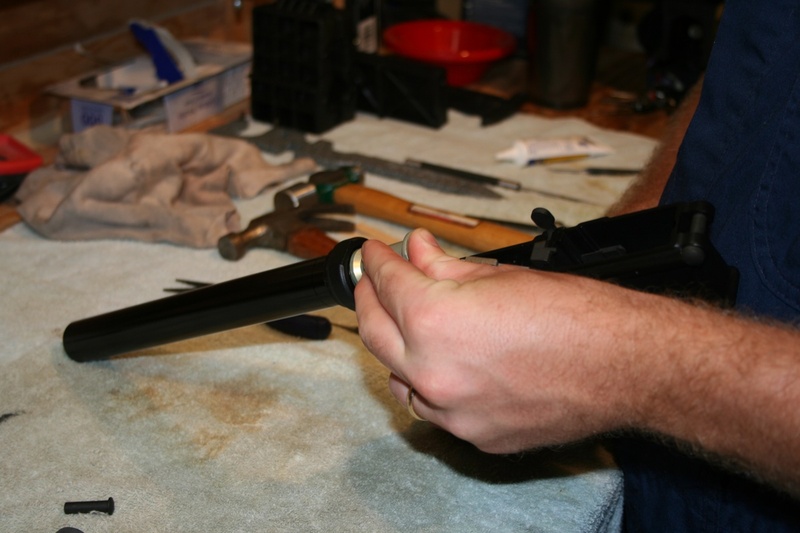 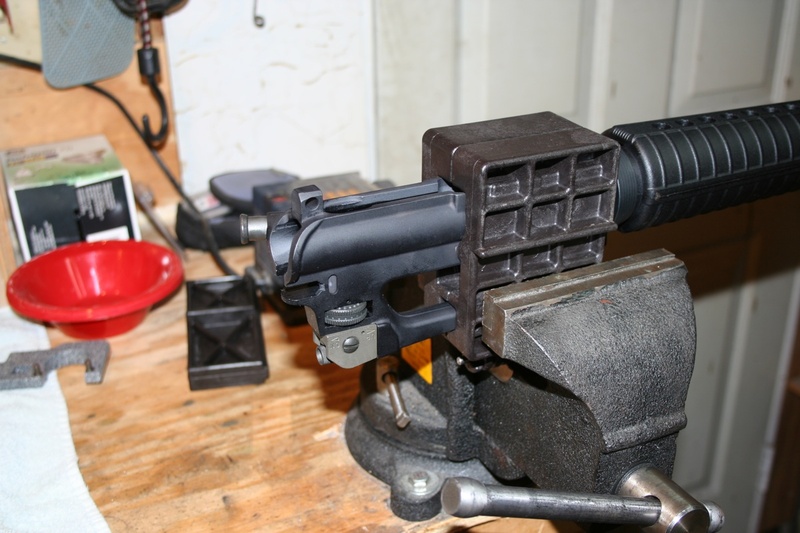 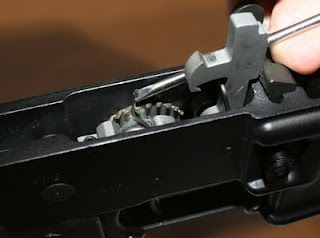 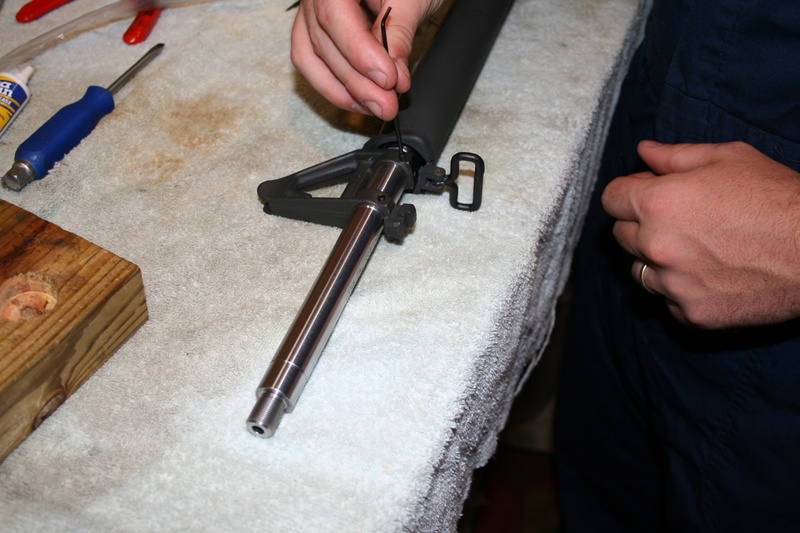 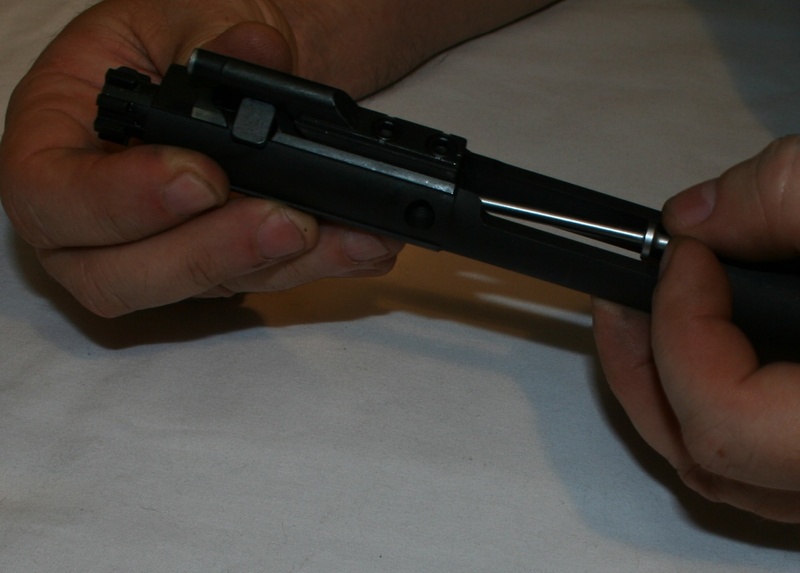 While holding the magazine catch in place with your finger, flip the lower over and slip the spring over the threaded post. 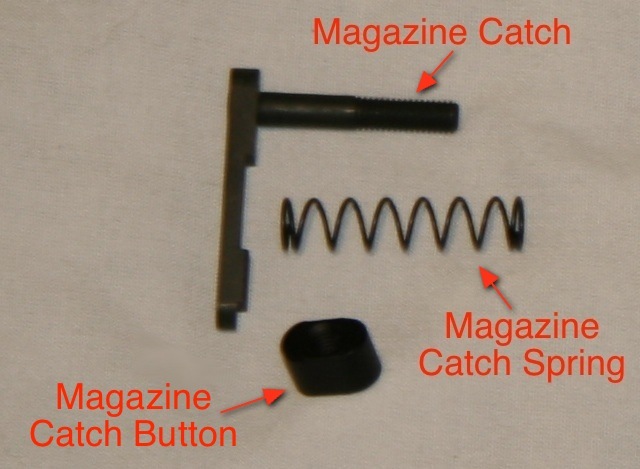 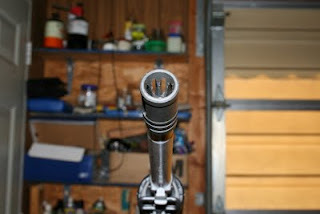 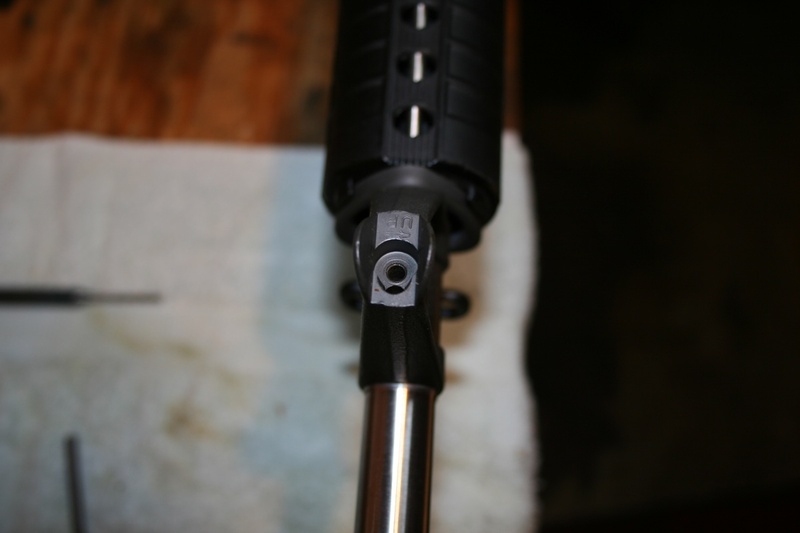 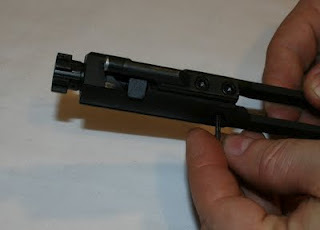 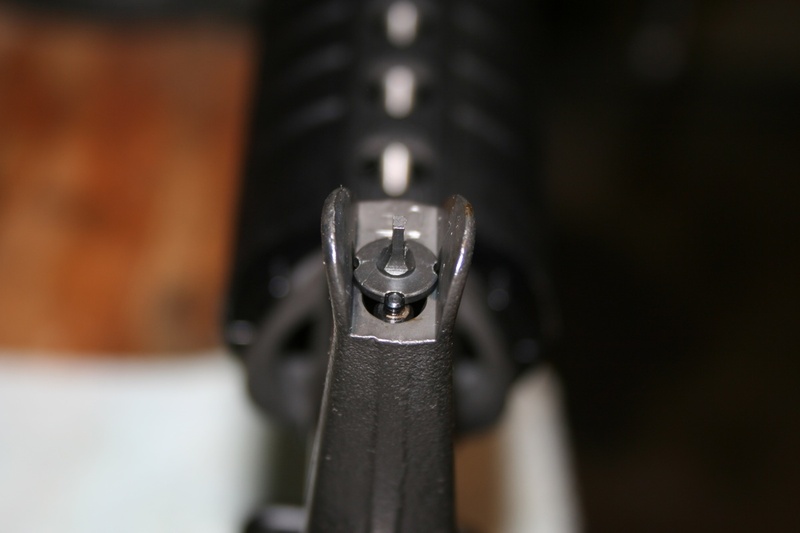 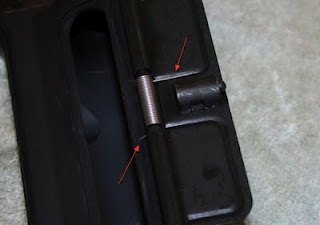 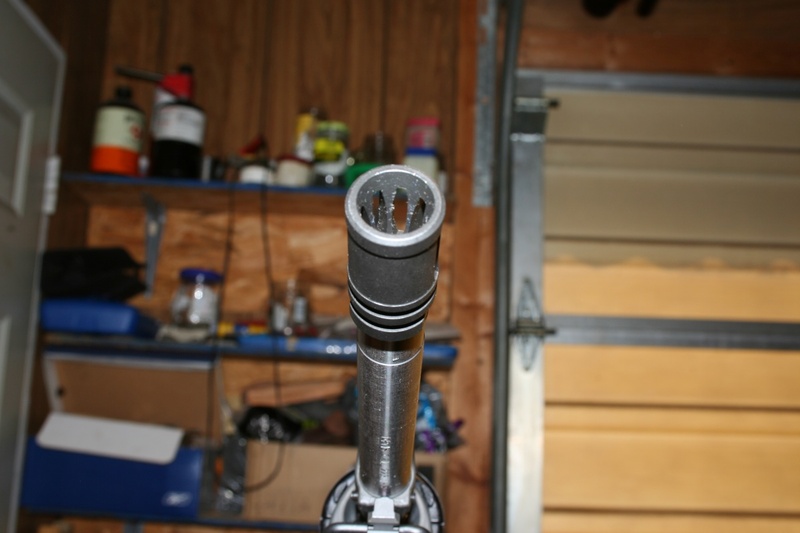 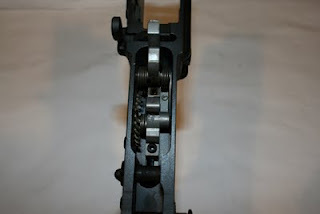 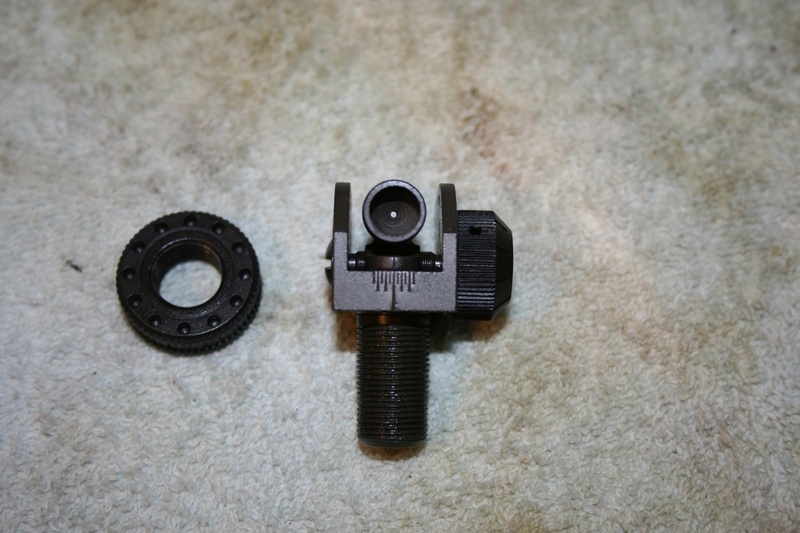 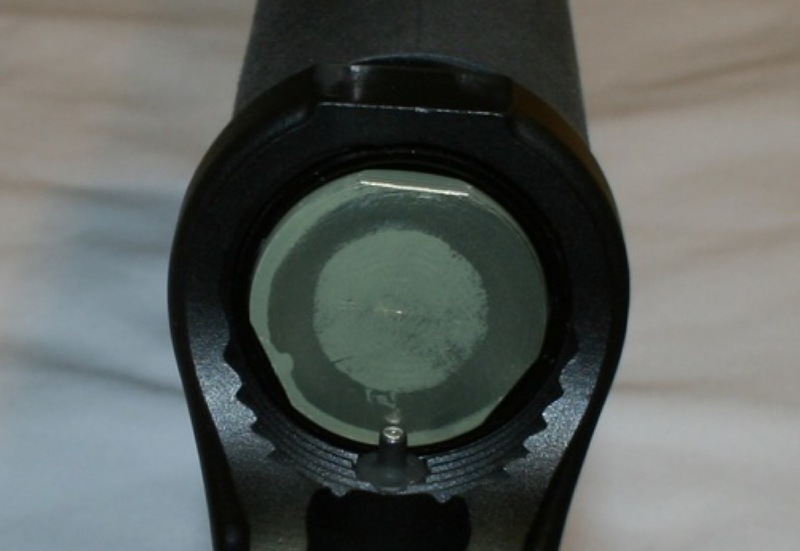 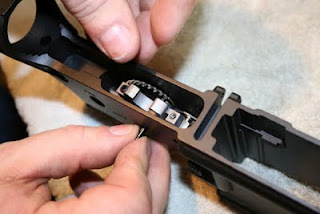 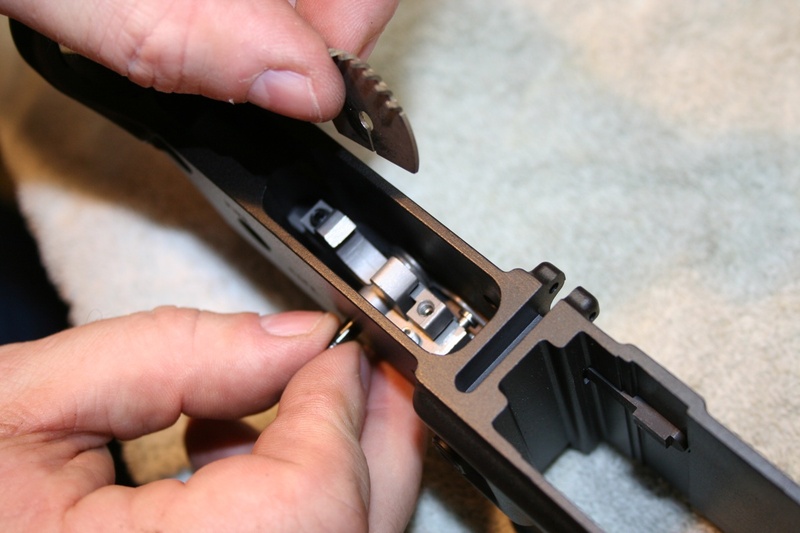 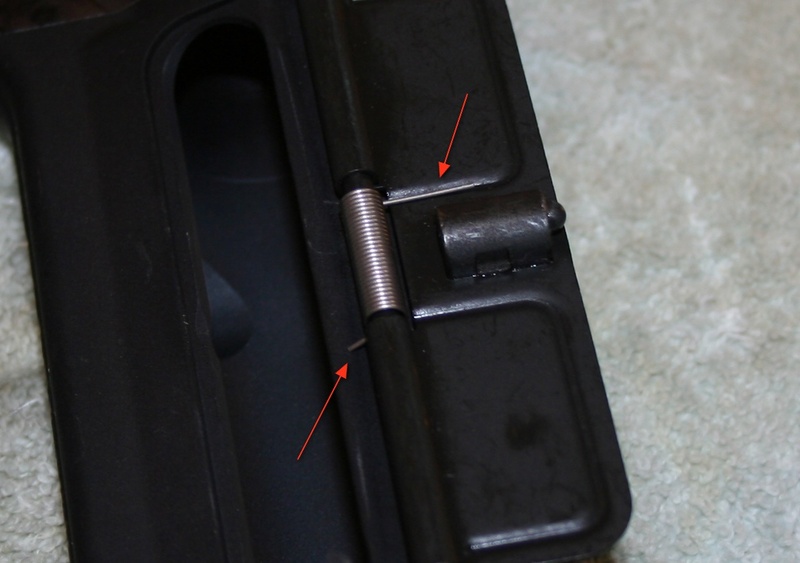 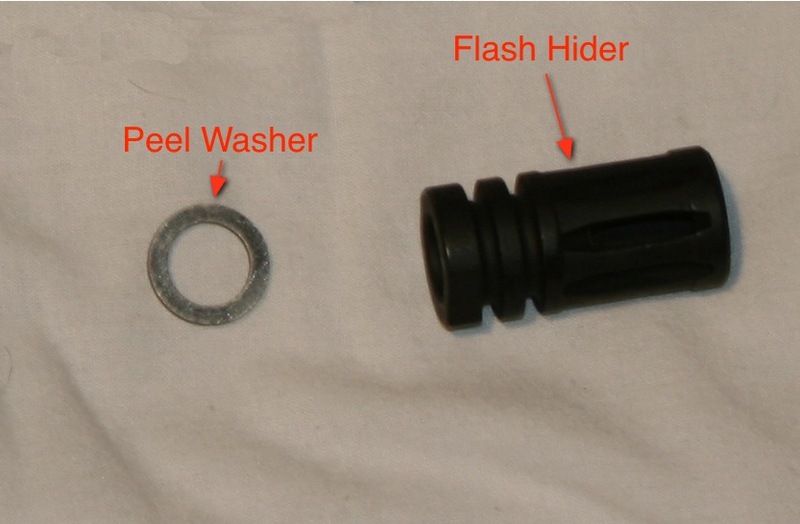 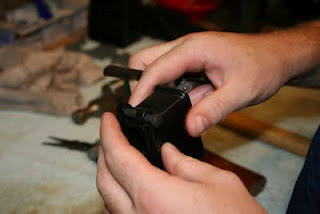 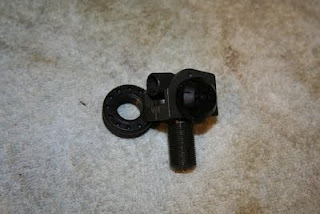 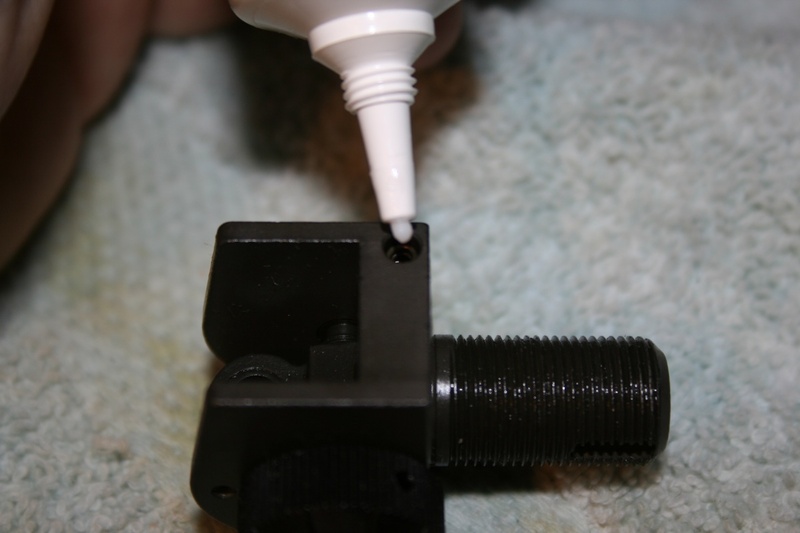 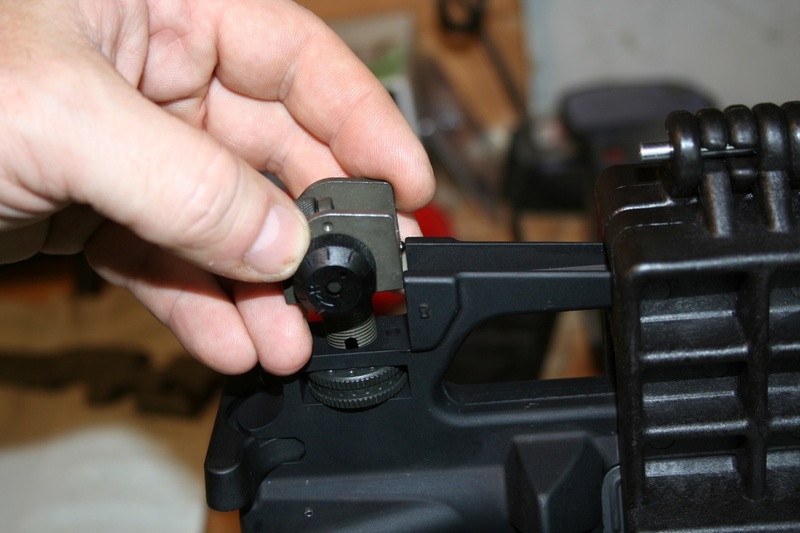 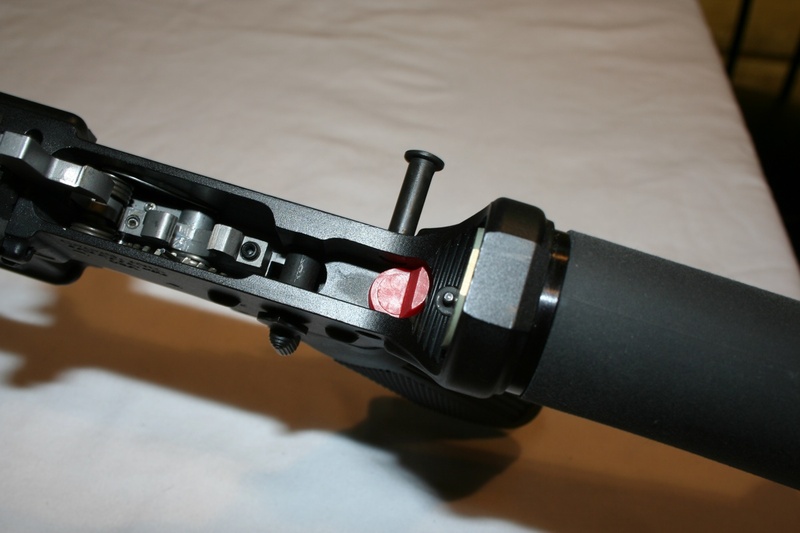 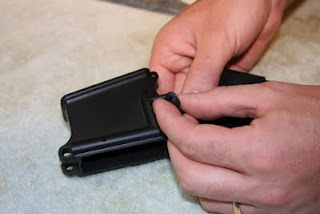 Then with the knurled part of the magazine catch button facing out, compress the spring with the button and screw the button onto the magazine catch post. 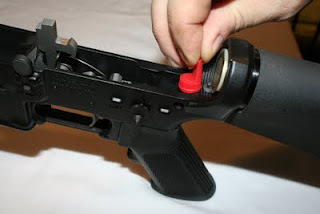 You’ll only be able to turn the button a couple of turns before the side of the lower interferes. At this point, align the button so that it fits into the oblong hole in the lower receiver, then press the button in as far as you can with your finger. While holding the button in, from the left side of the receiver, turn the magazine catch to continue screwing the post into the button. 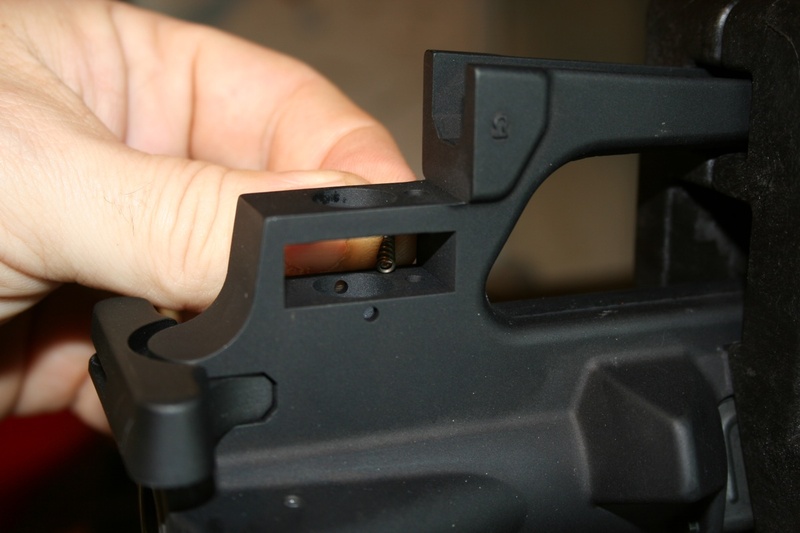 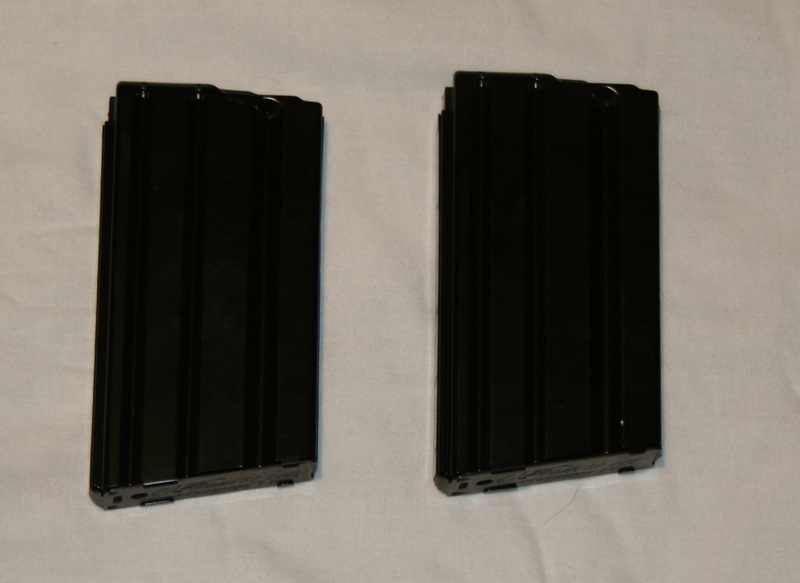 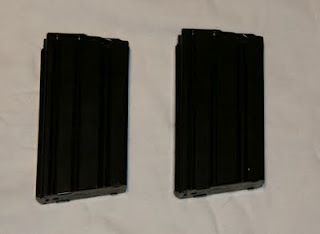 Again, you’ll get to the point where the receiver interferes and you won’t be able to screw the magazine catch down far enough. 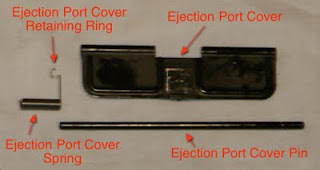 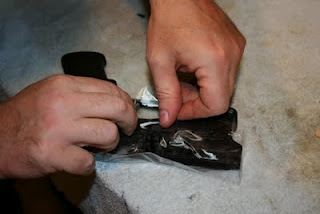 At that point, use a punch or other long, slender object, padded with a rag to keep from marring the finish, to compress the button further into the receiver. 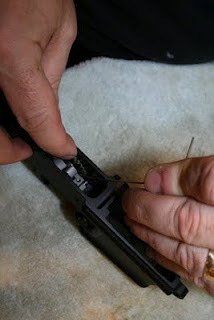 Continue turning the magazine catch until the post is about even with the top of the threads inside the button. Line the magazine catch up with its well in the left side of the receiver and allow it the spring tension to press the catch into place. 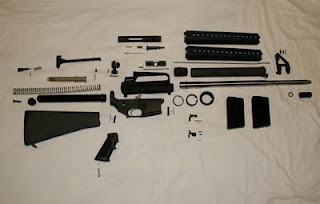 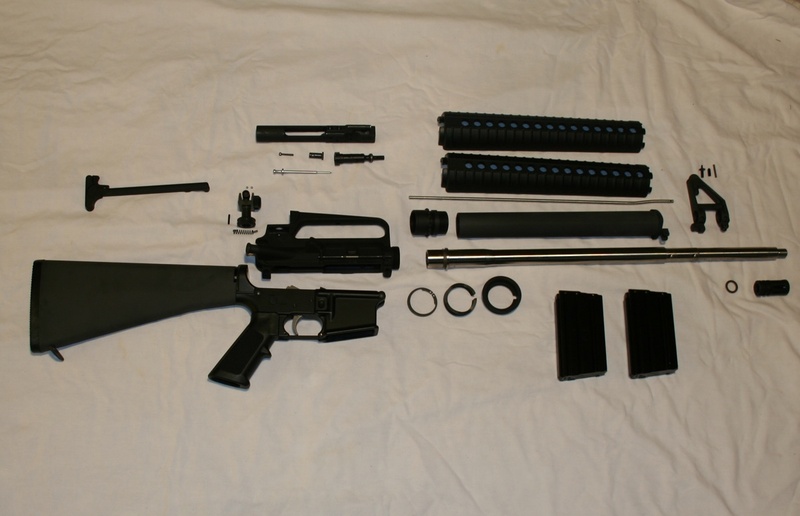 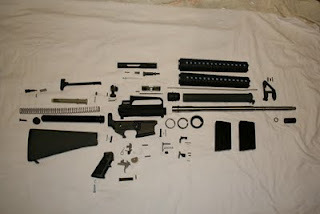 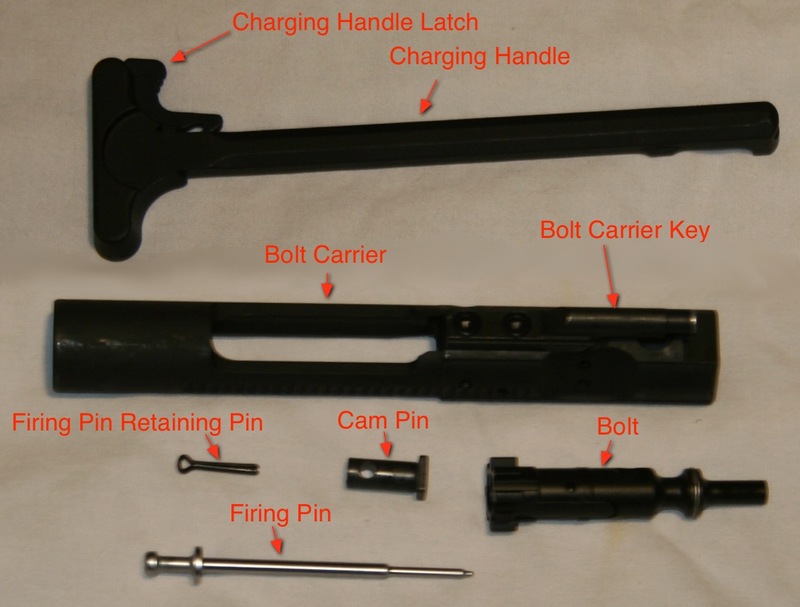 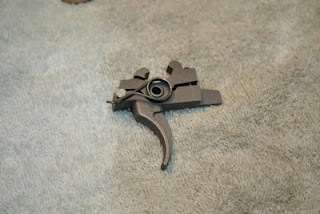 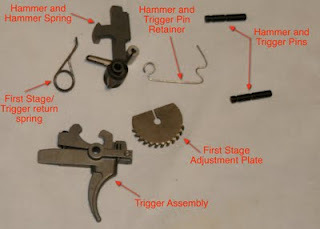 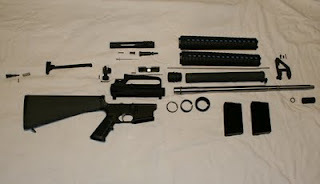 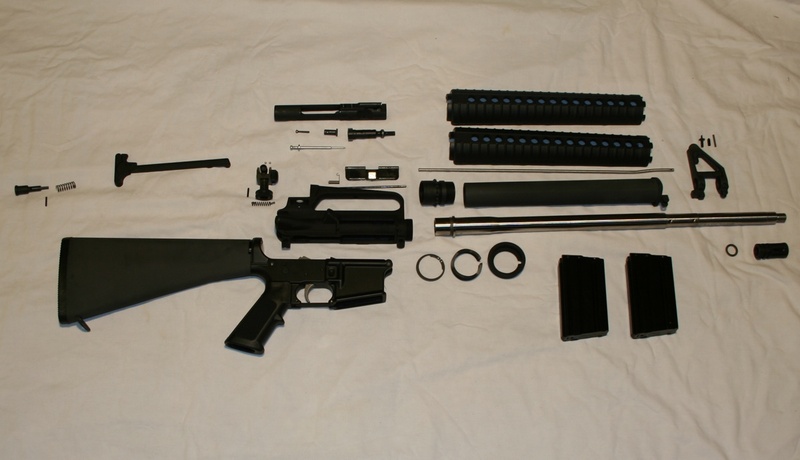 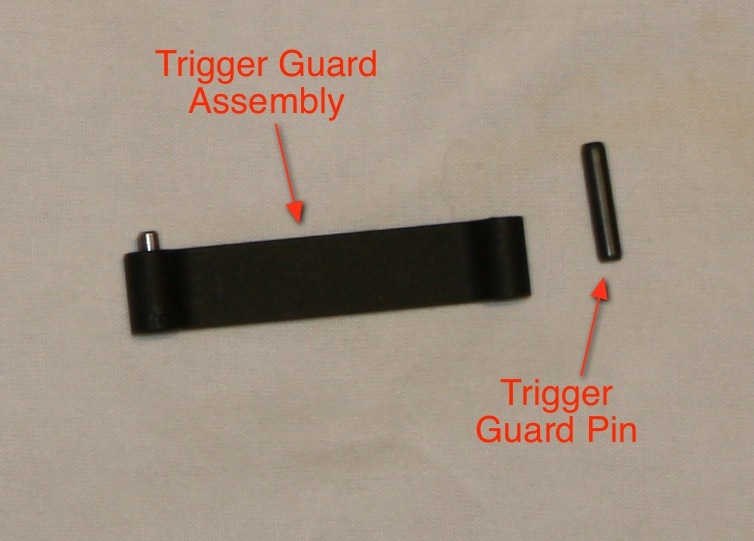 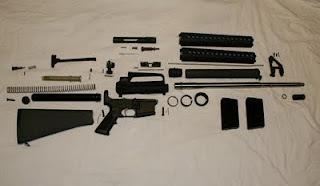 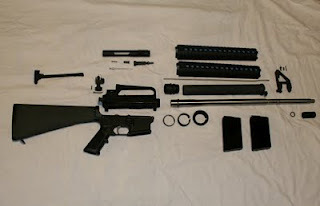 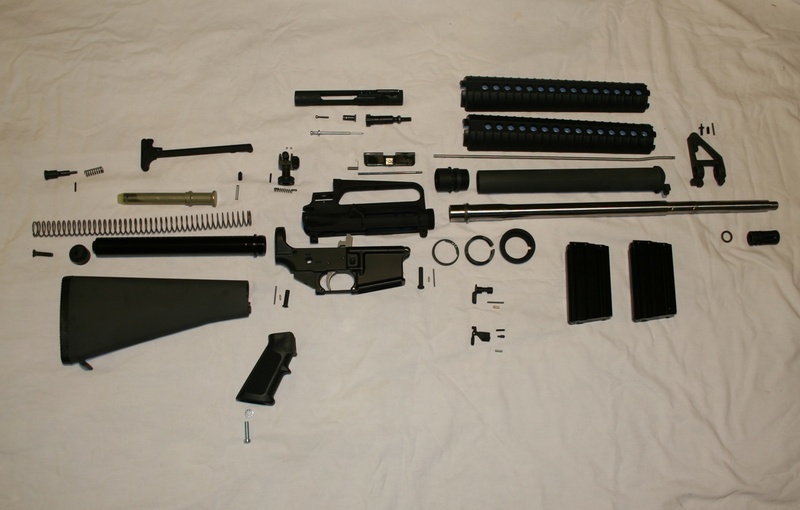 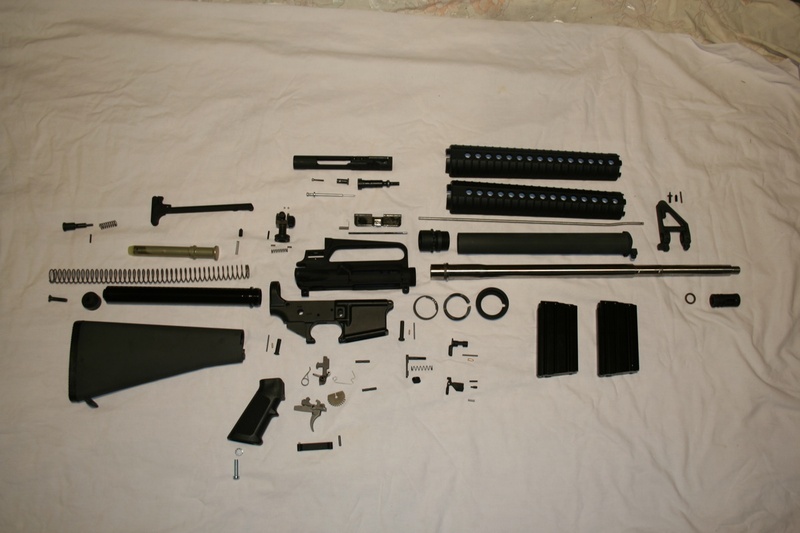 The trigger guard assembly itself contains a spring and pin (the silver piece), but generally come pre-assembled. 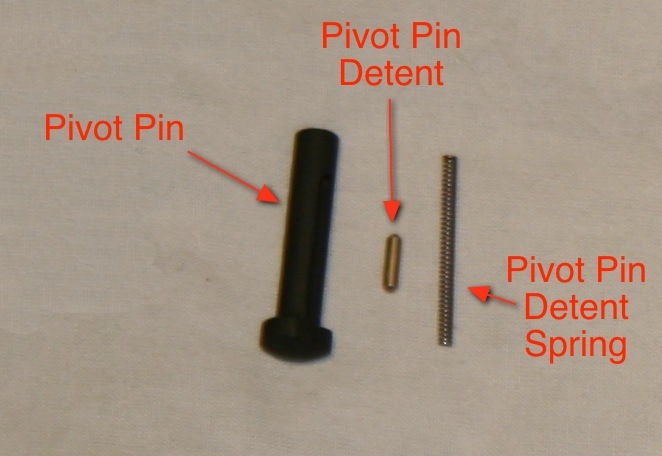 The only other component is the roll pin. For some reason, I didn’t take any pictures of the assembly itself so I’m going to recycle a couple of pictures from the last assembly. These pictures are from my old camera so you’ll be able to compare exactly how much better the new camera is as compared to the old one. 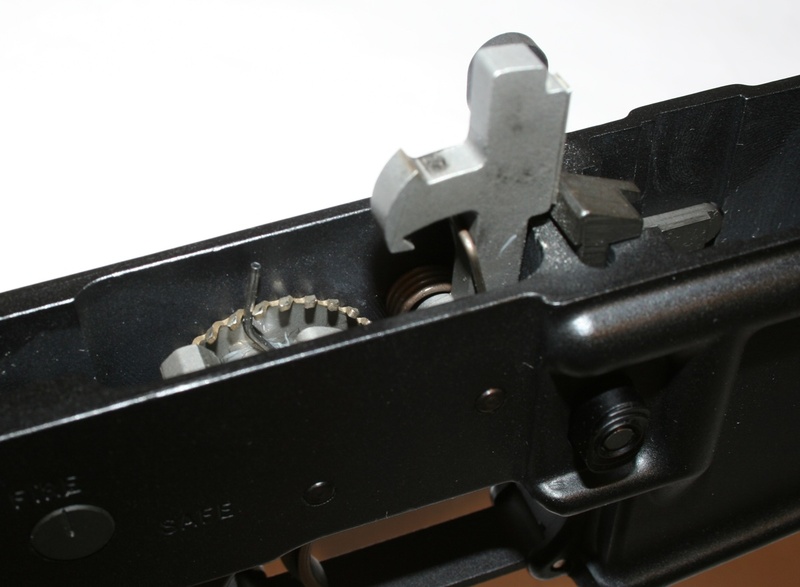 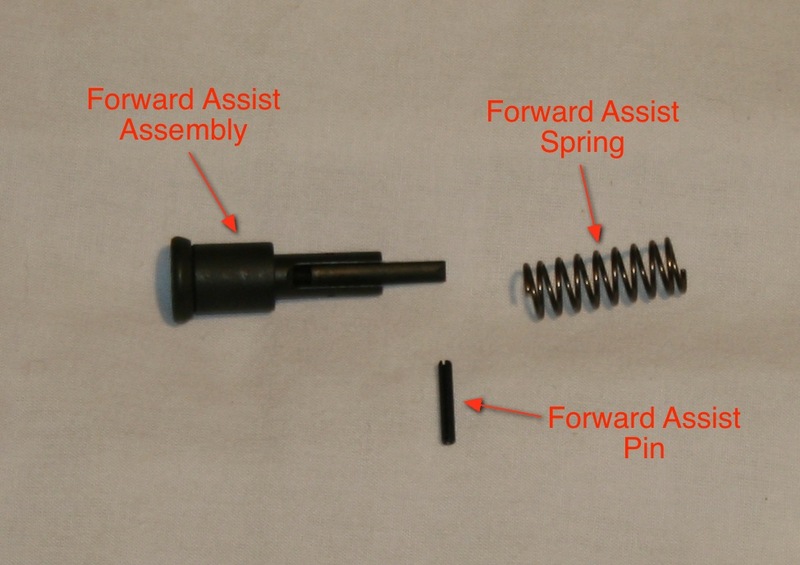 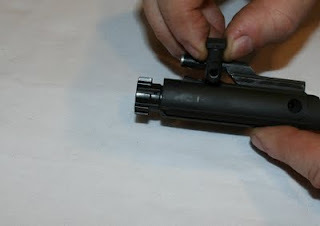 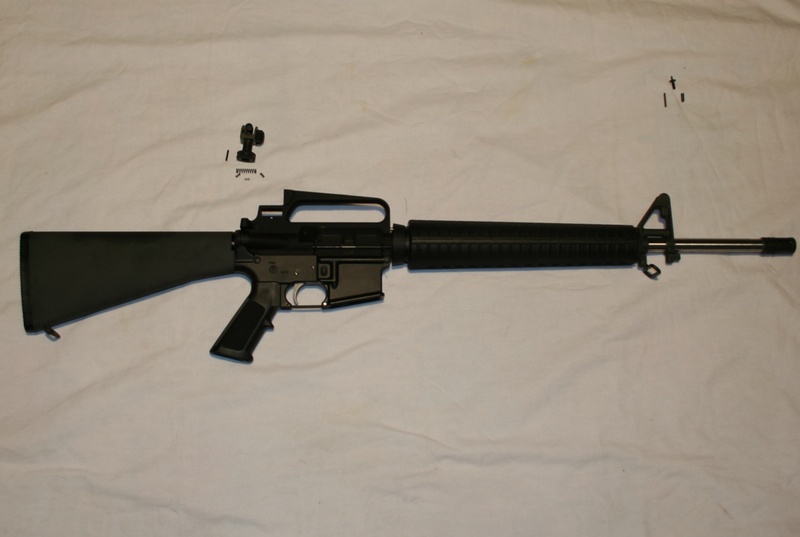 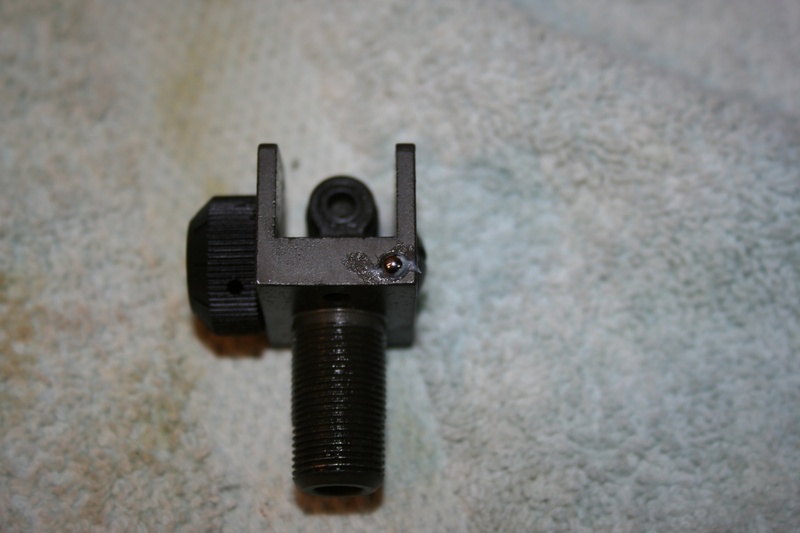 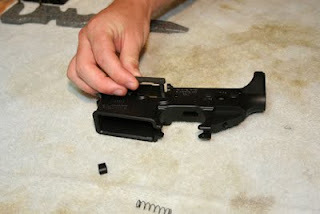 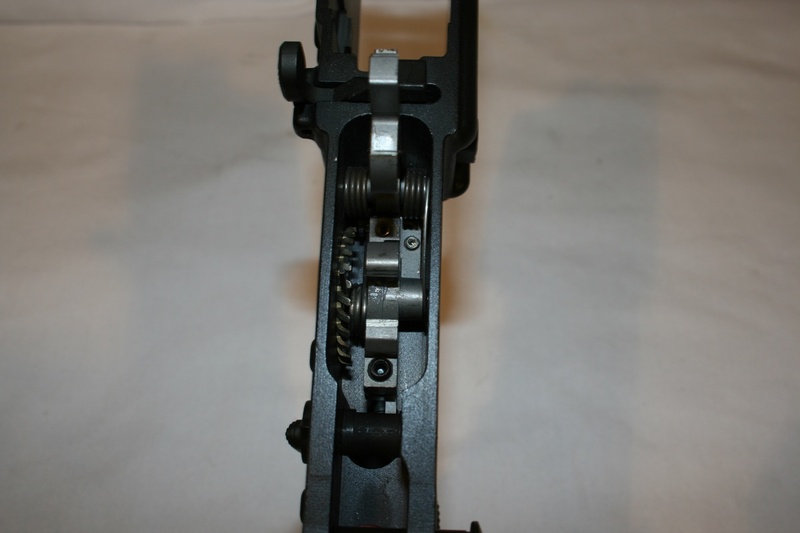 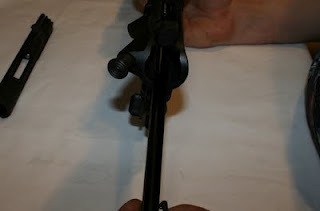 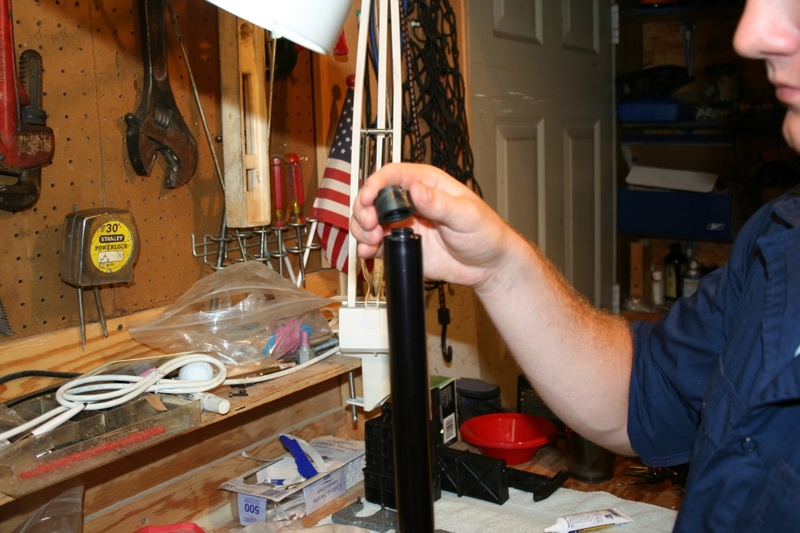 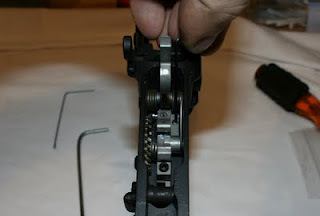 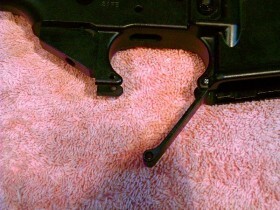 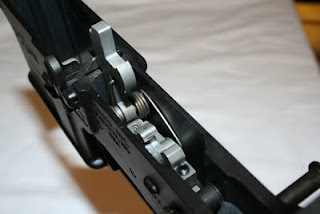 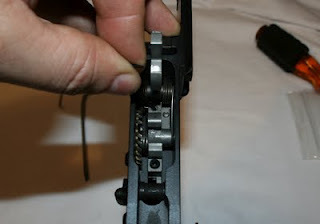 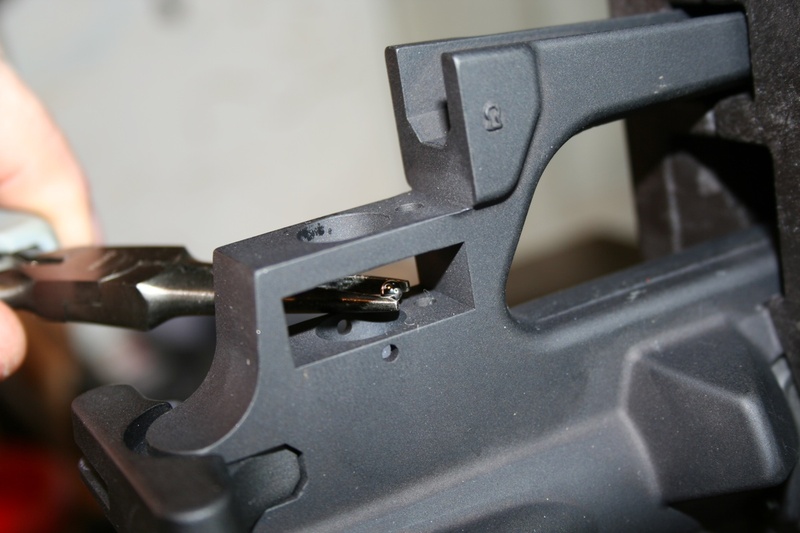 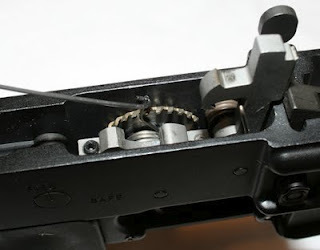 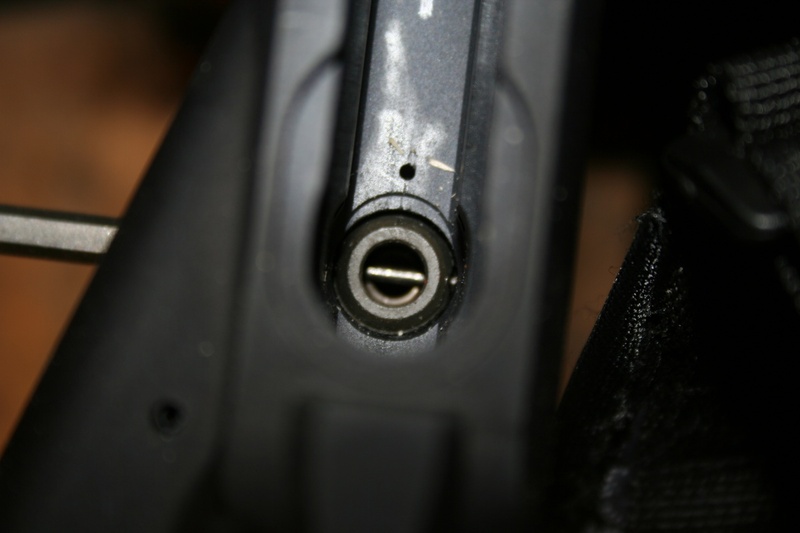 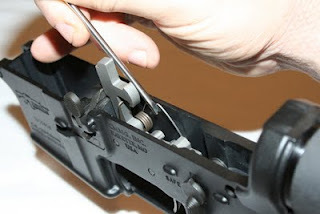 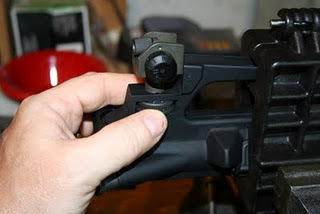 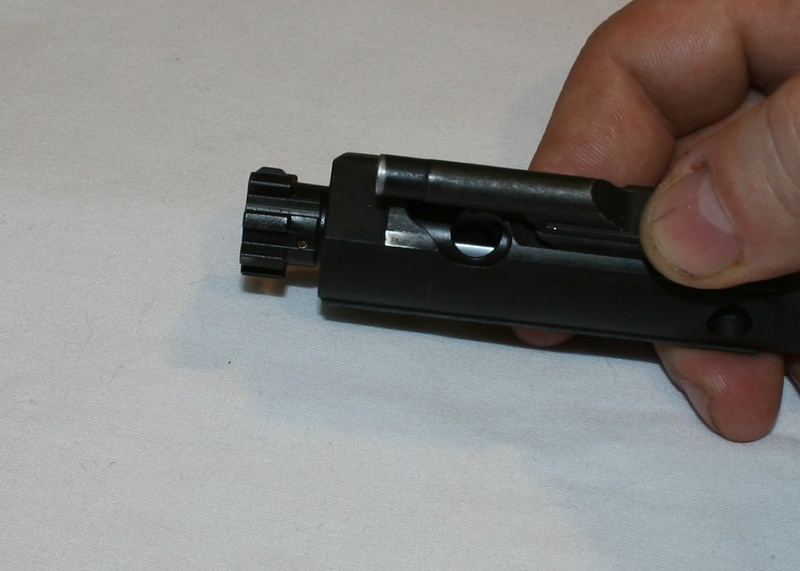 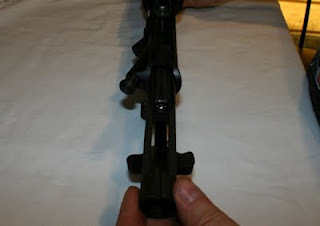 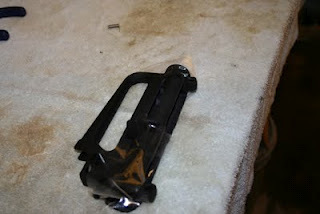 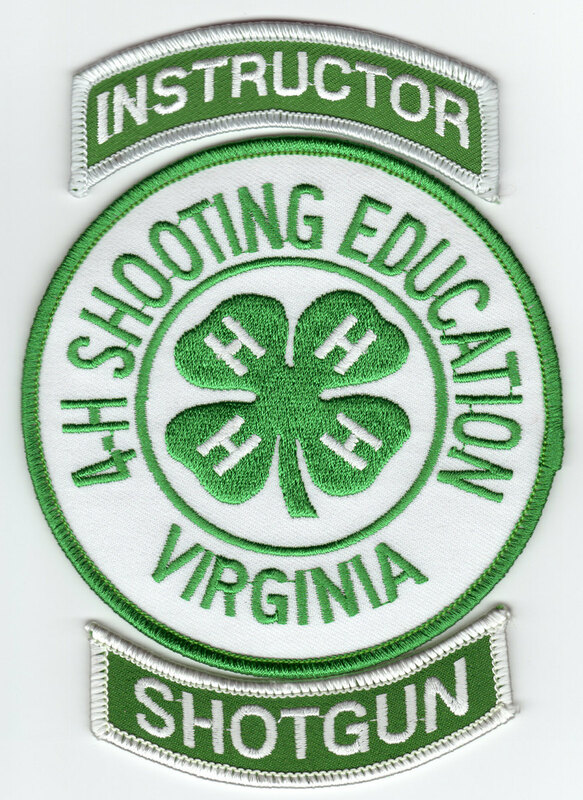 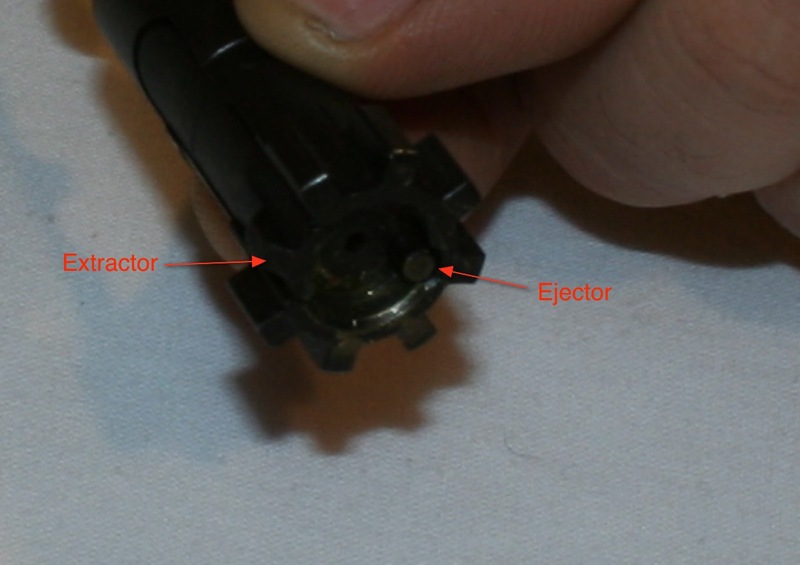 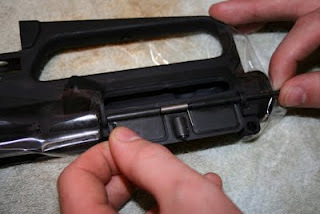 The end of the trigger guard with the spring loaded pin goes to the front of the receiver. It can really go in one way because there is only one hole in the receiver mounting ears. 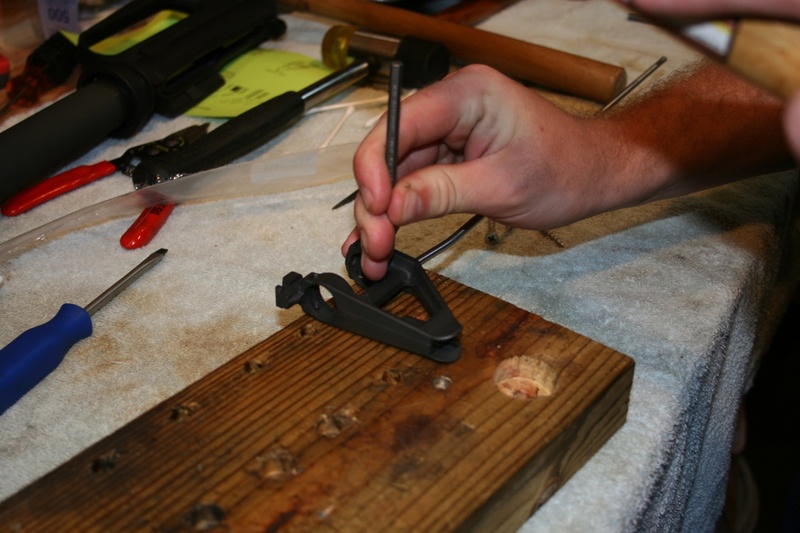 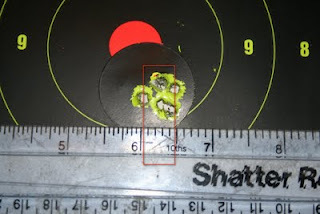 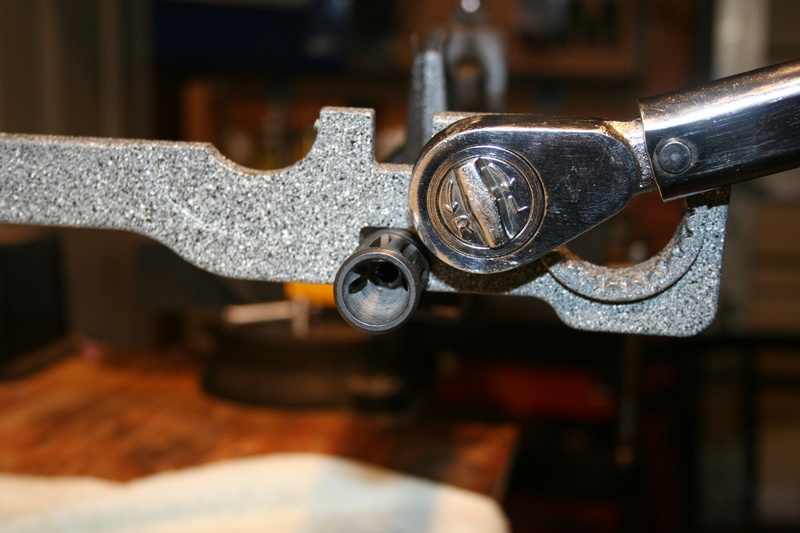 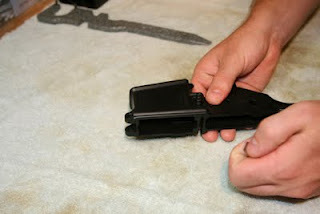 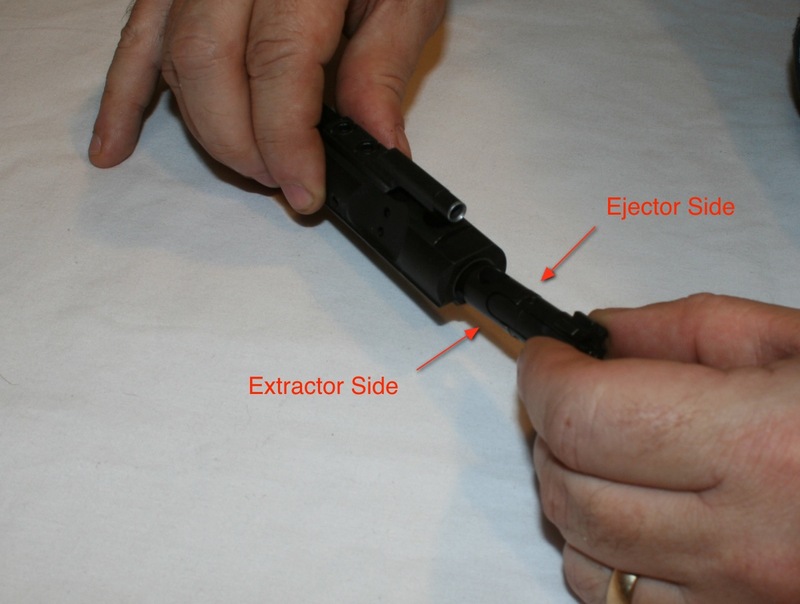 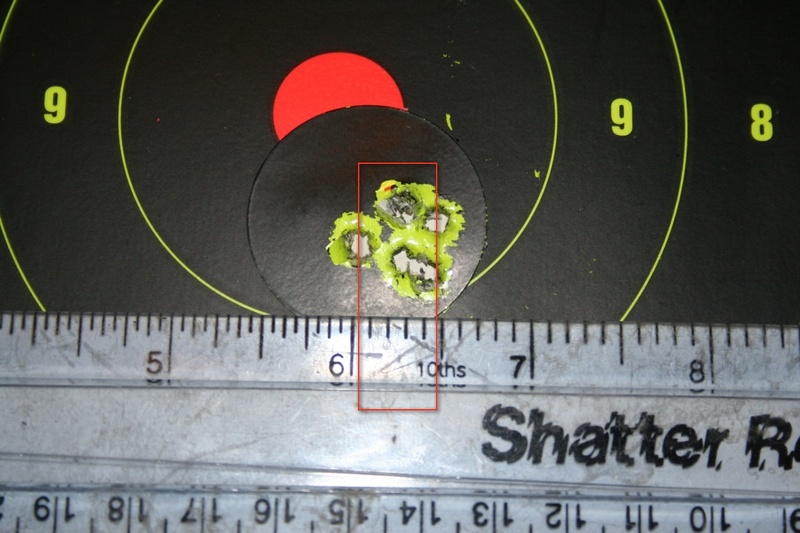 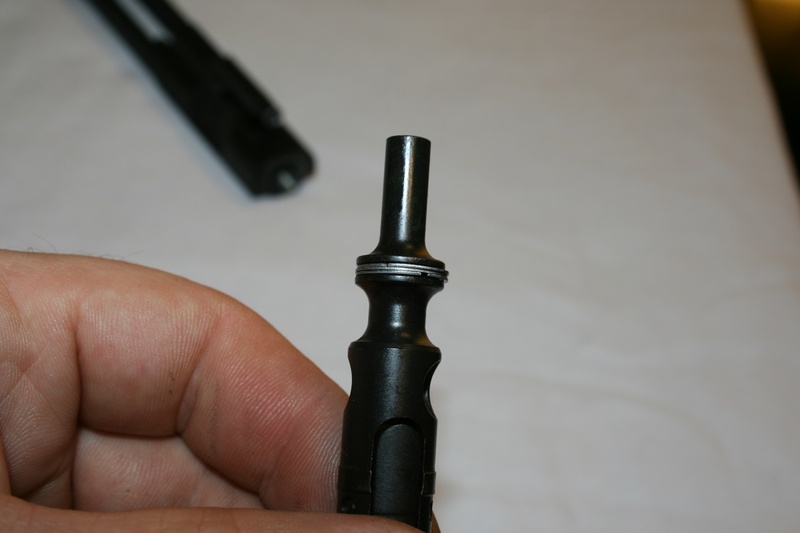 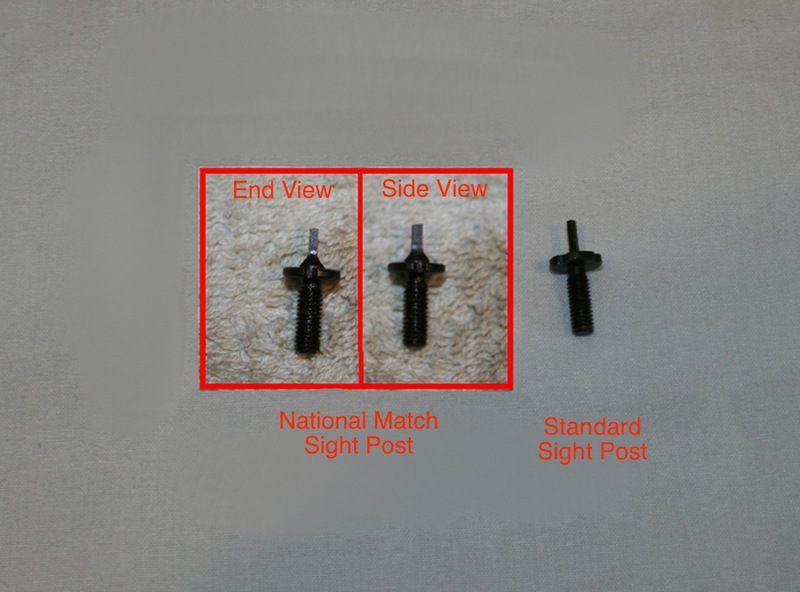 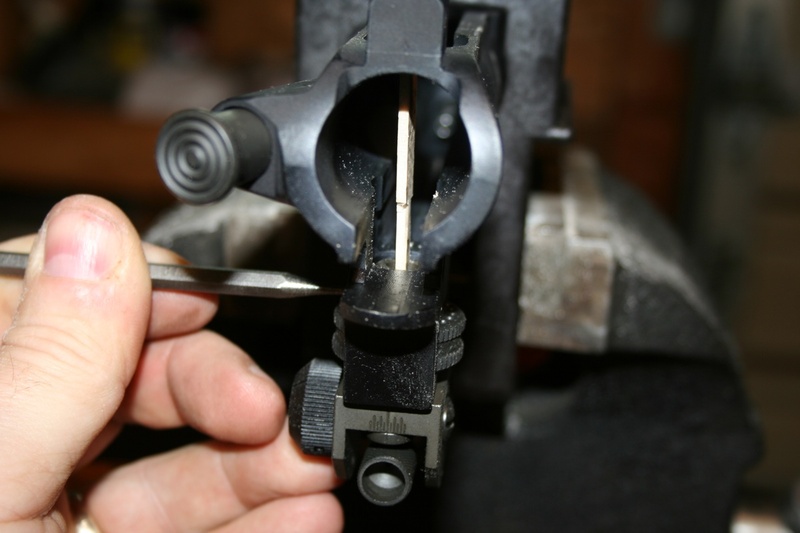 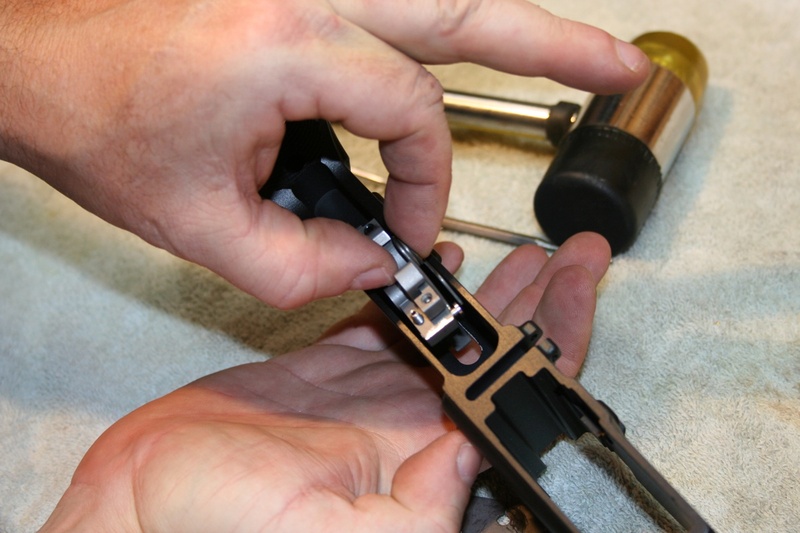 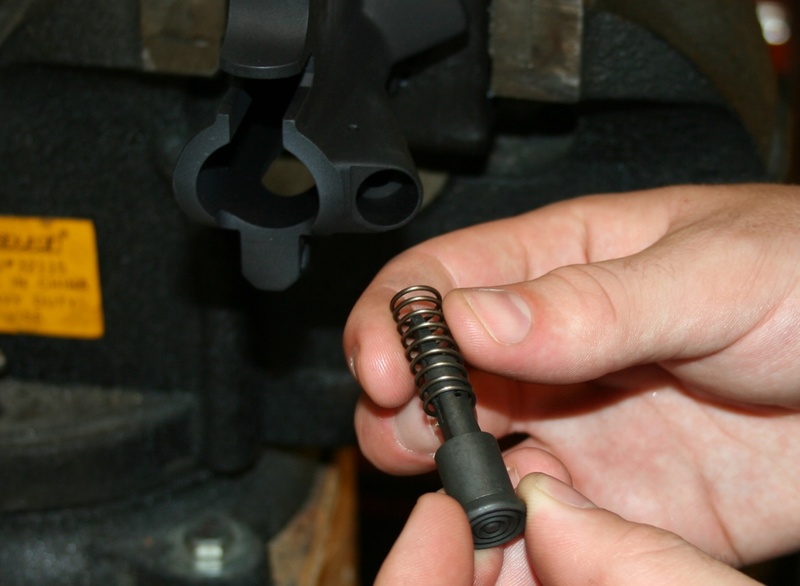 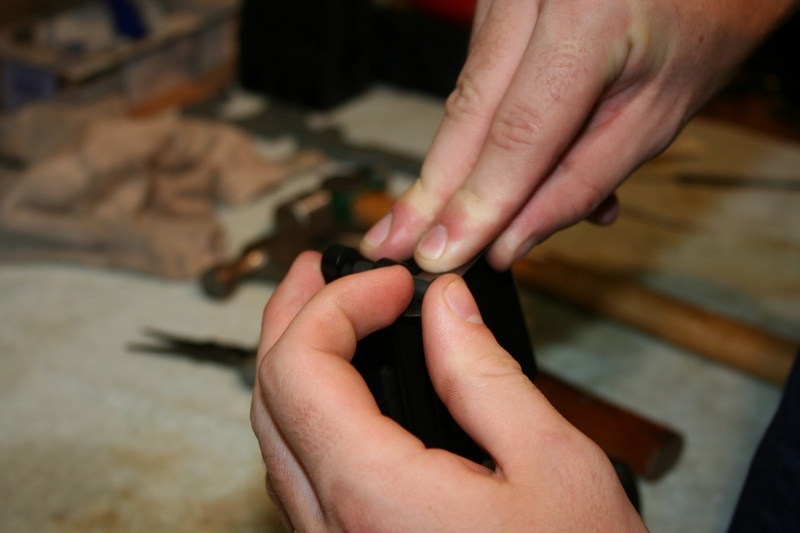 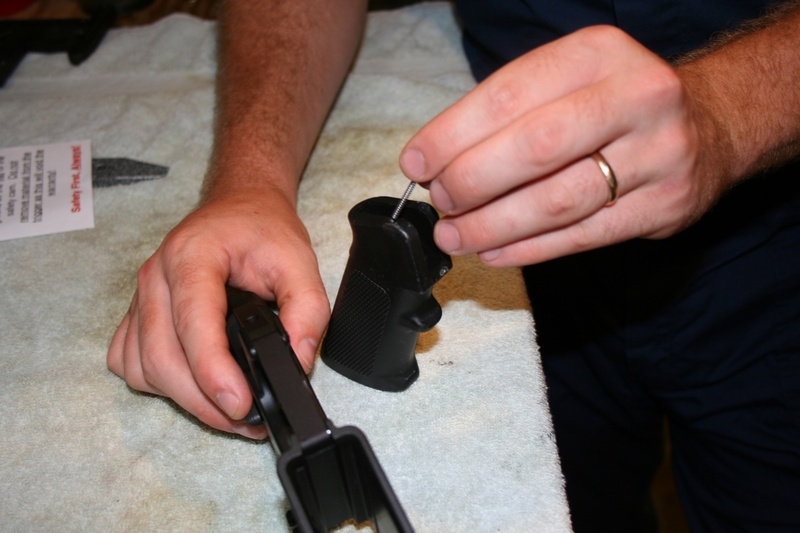 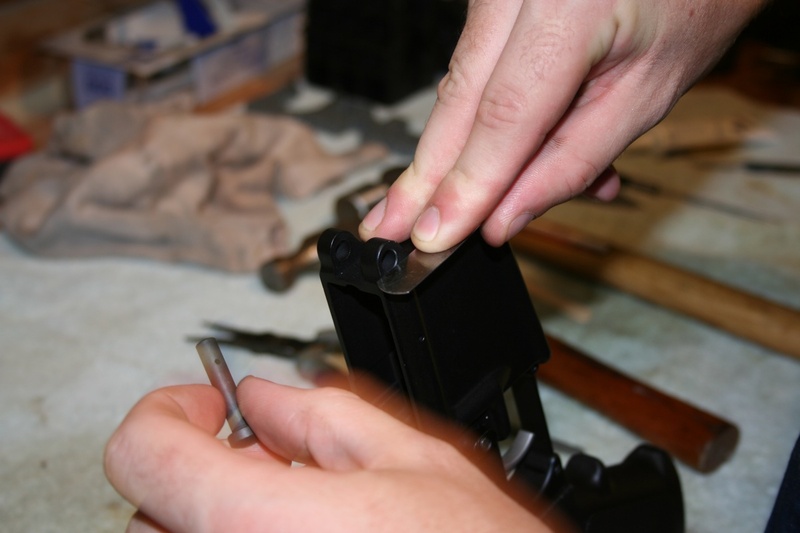 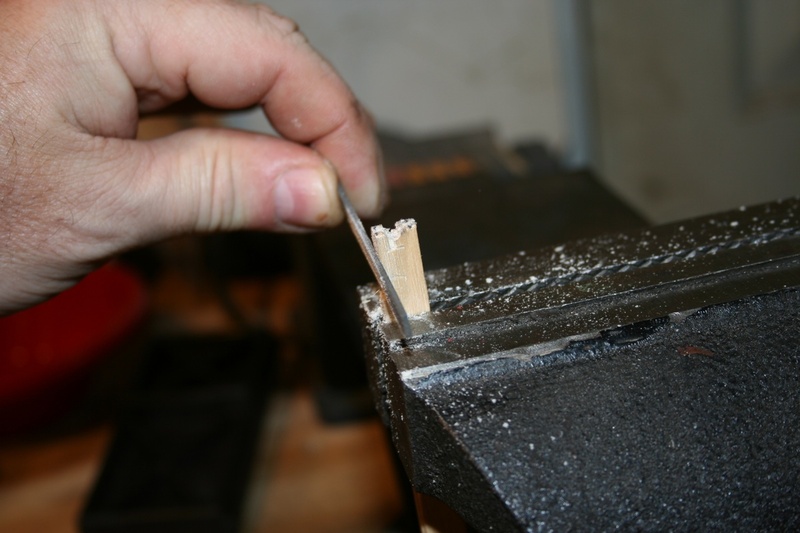 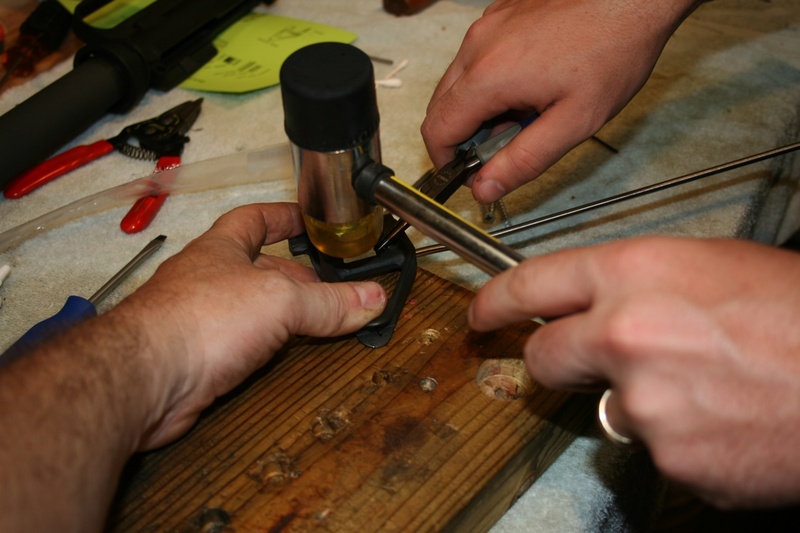 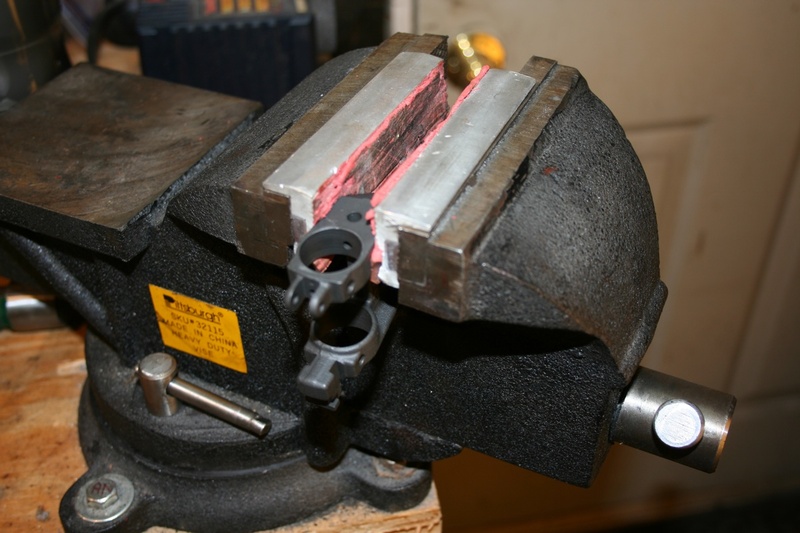 Match the side of the trigger guard without the pin, to the mounting ear with no hole. 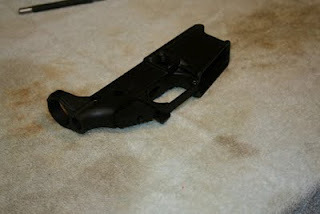 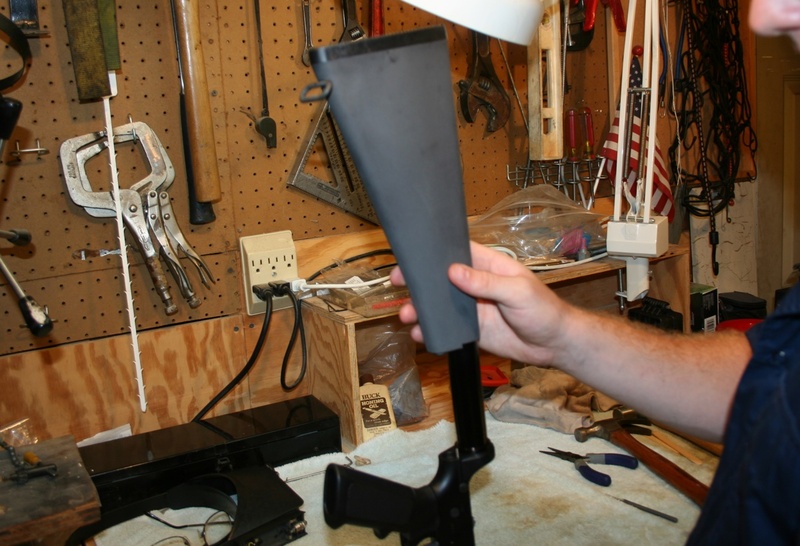 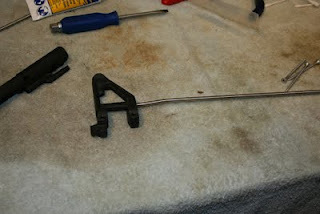 Angle the trigger guard so that the plain side goes in first. 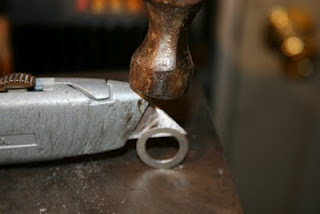 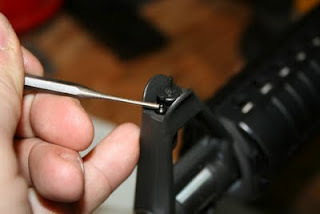 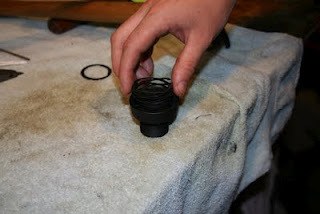 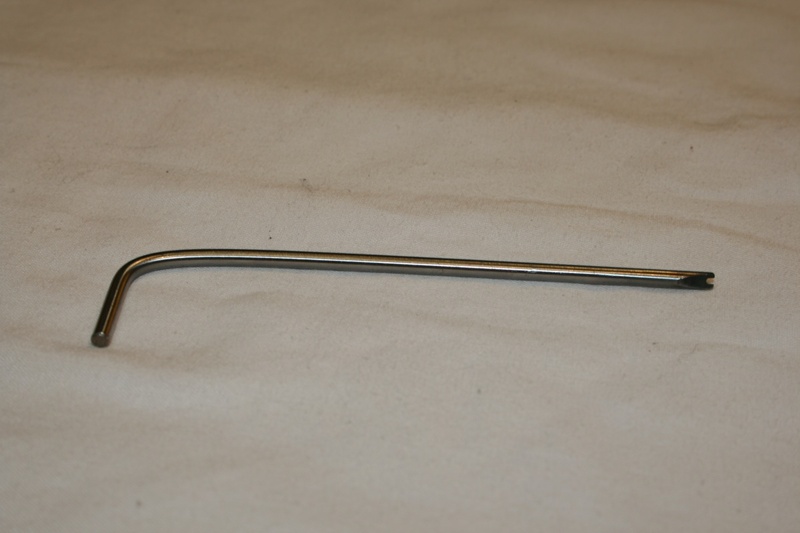 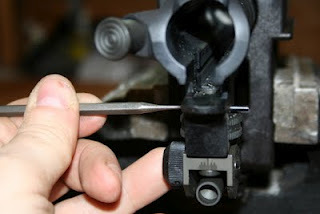 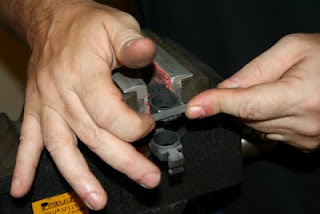 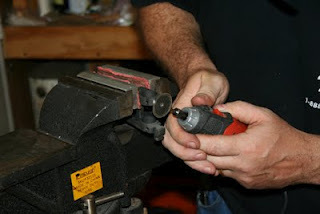 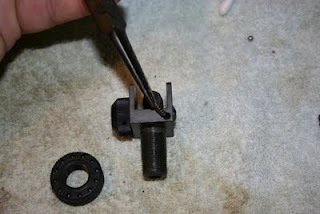 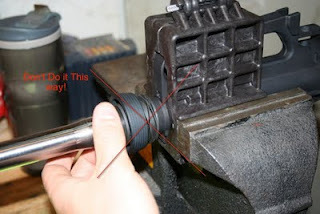 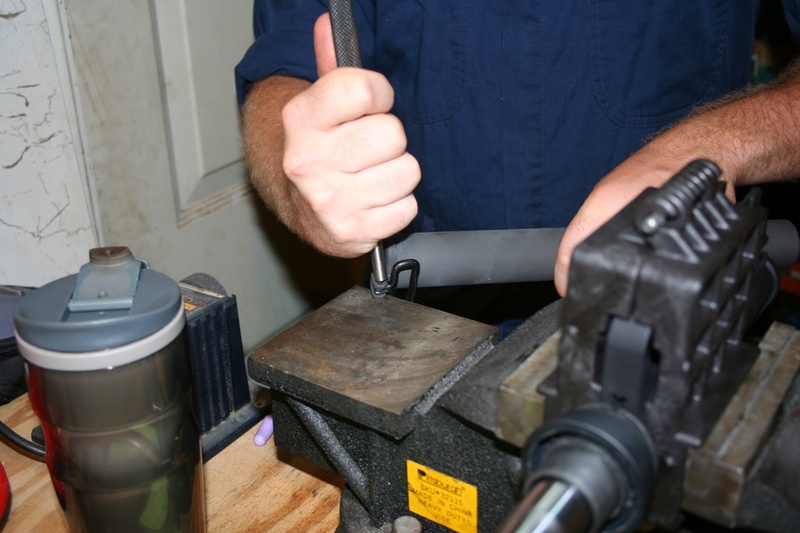 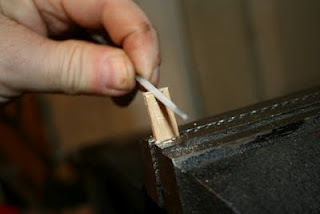 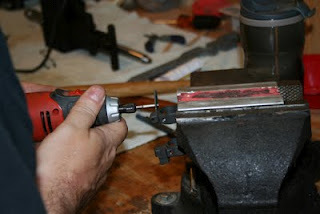 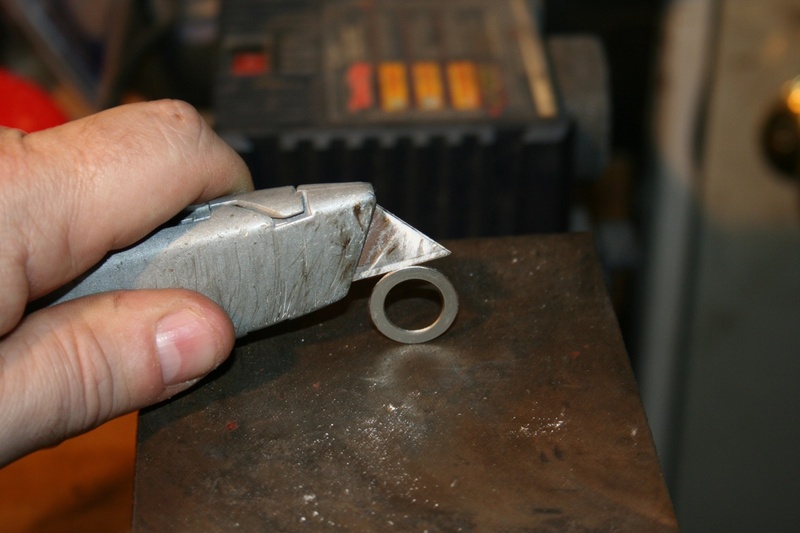 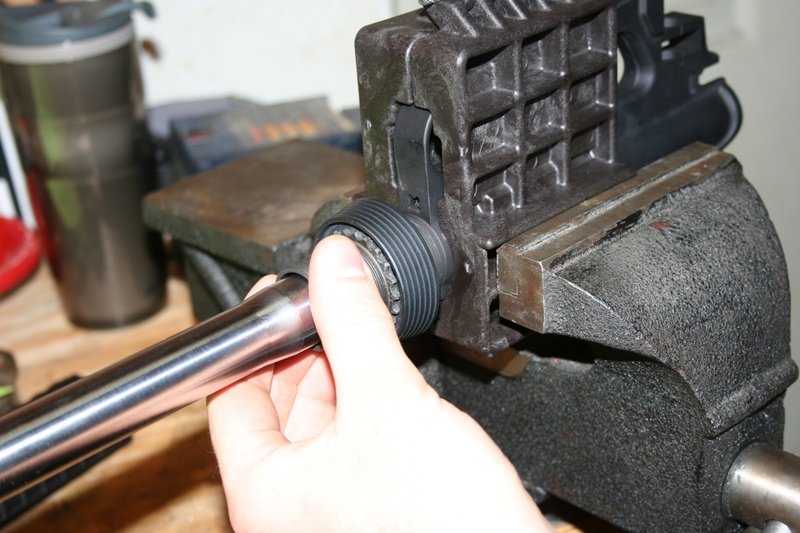 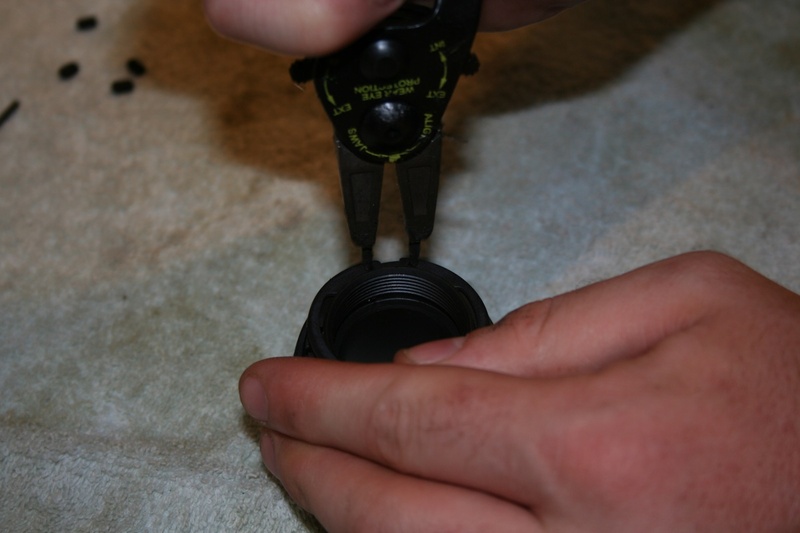 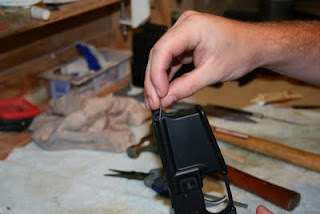 Press the spring loaded pin in with your finger, and then rock the pin side down onto the mounting ear. 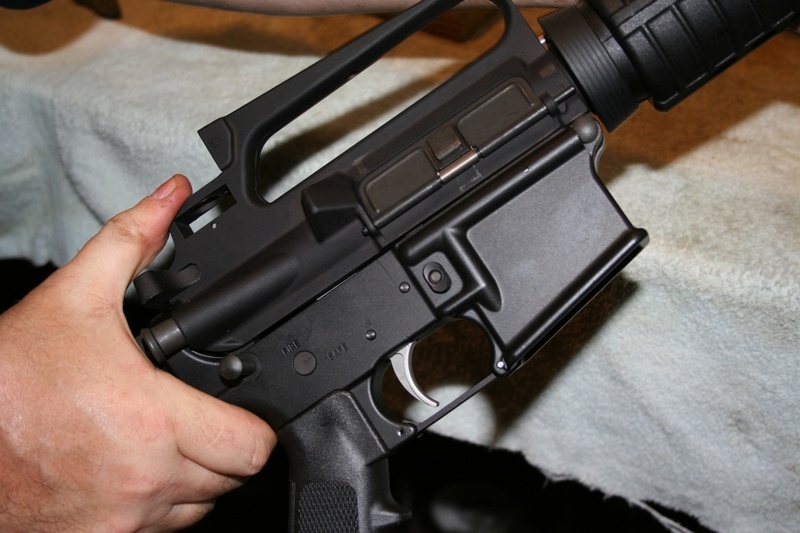 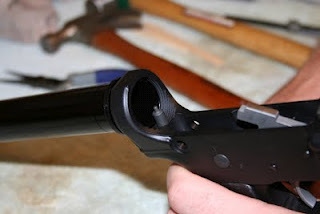 As soon as the pin is lined up with the hole in the mounting ear, it will snap into the hole, locking the trigger guard in place. 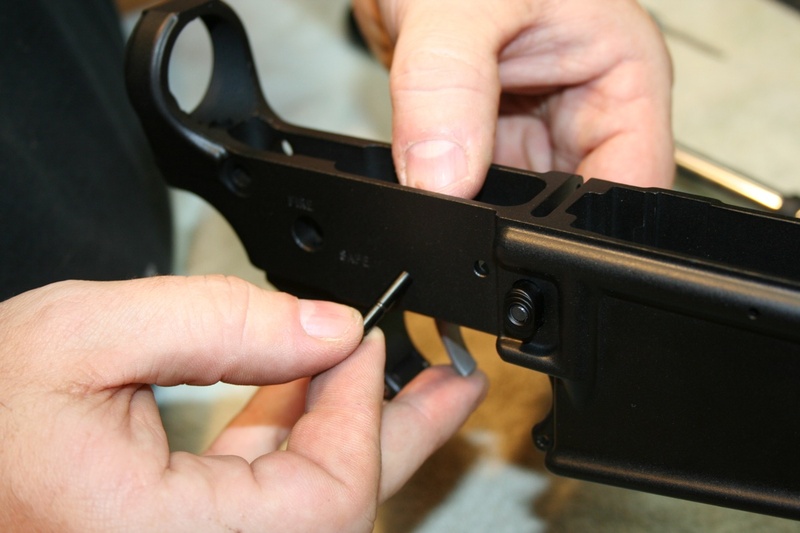 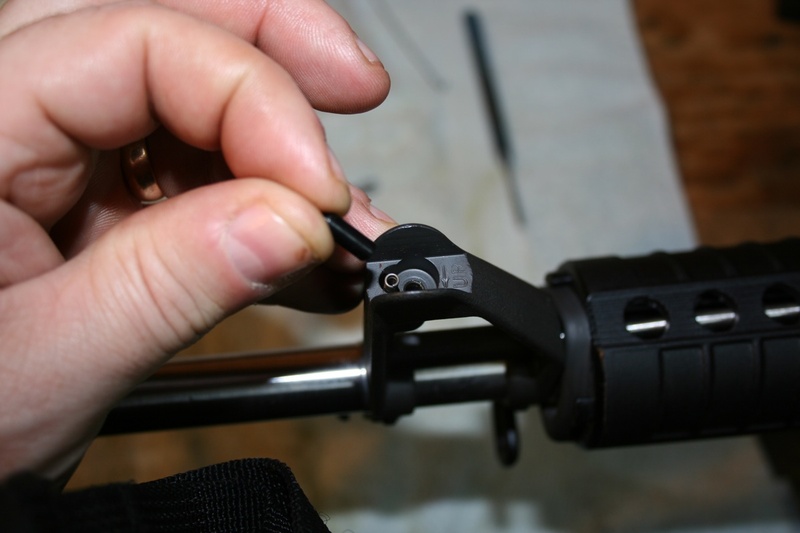 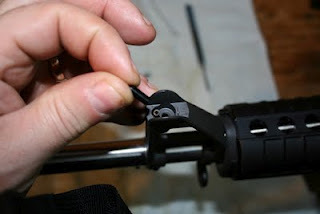 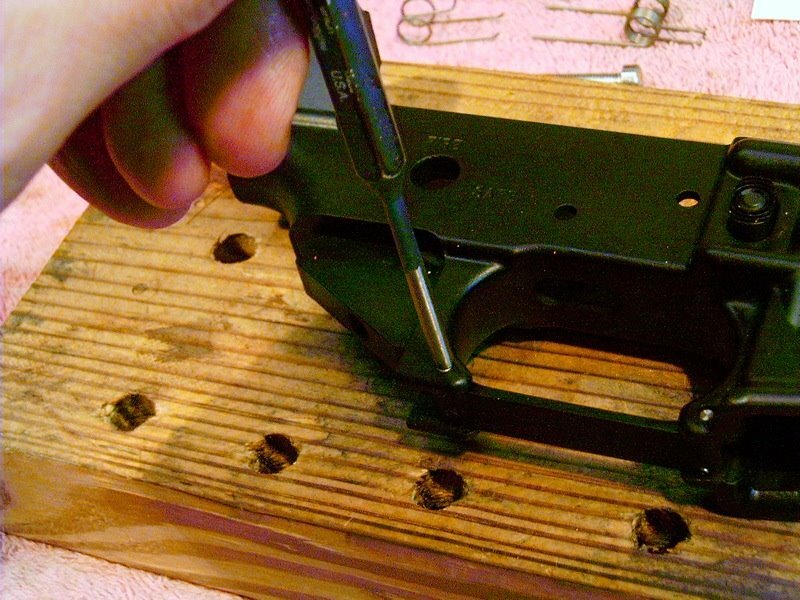 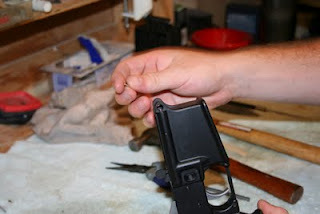 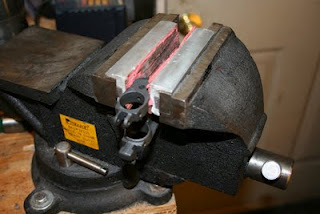 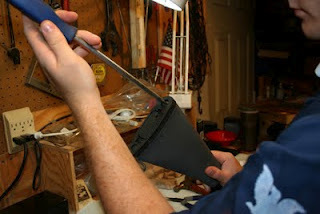 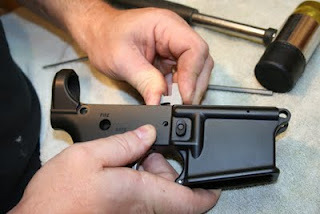 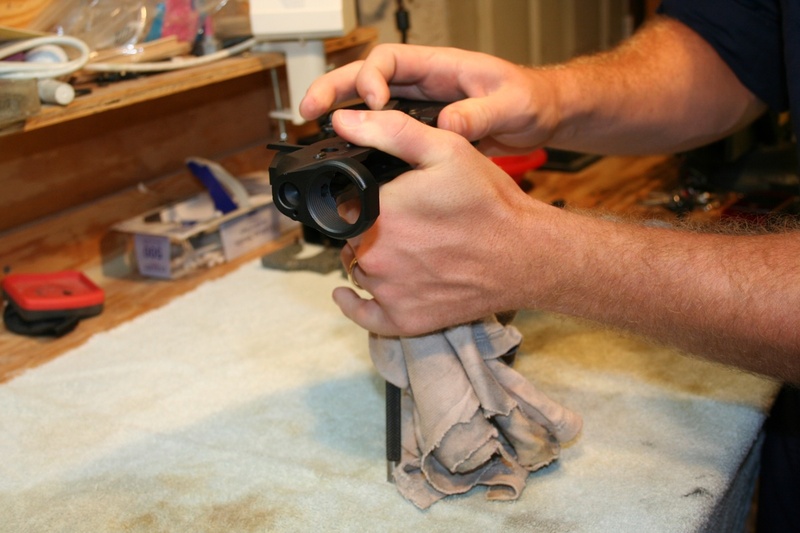 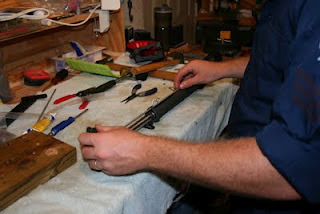 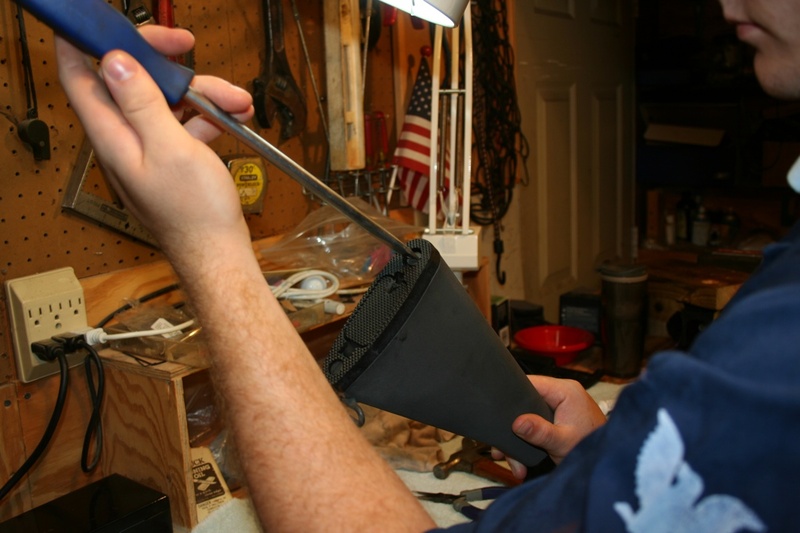 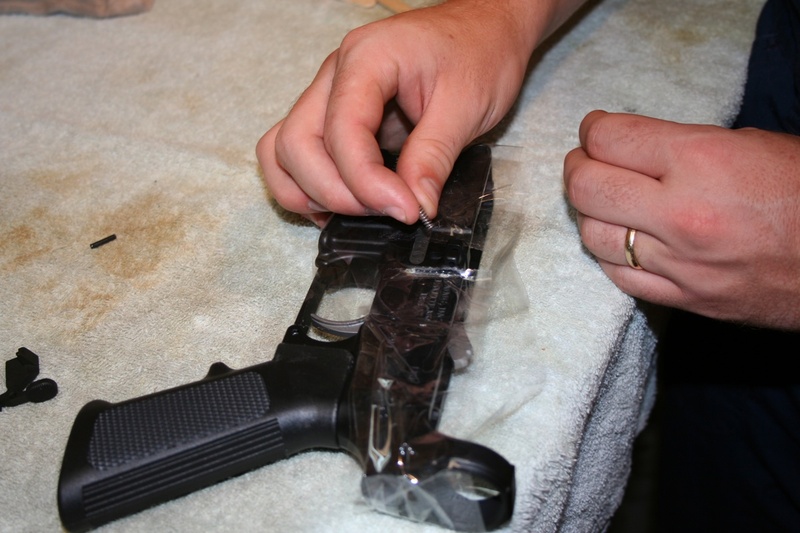 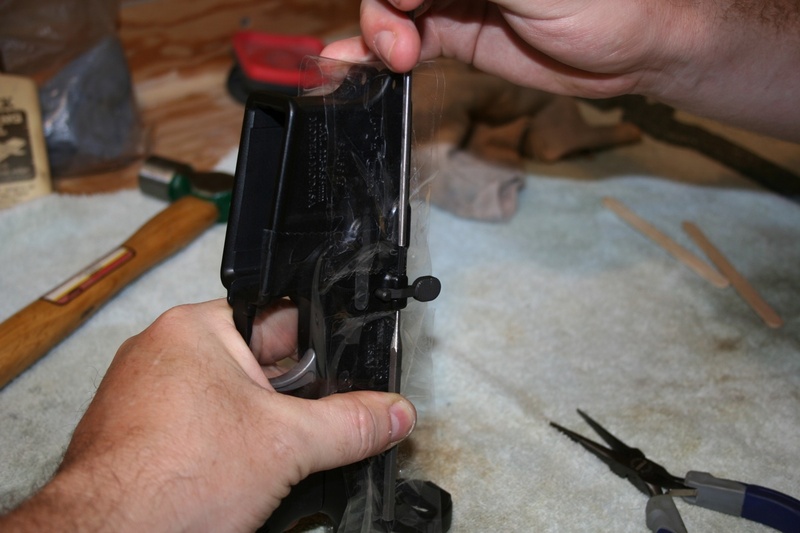 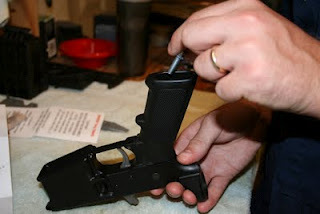 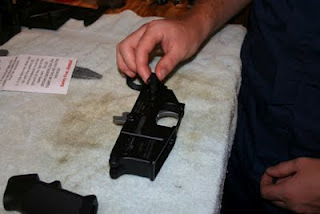 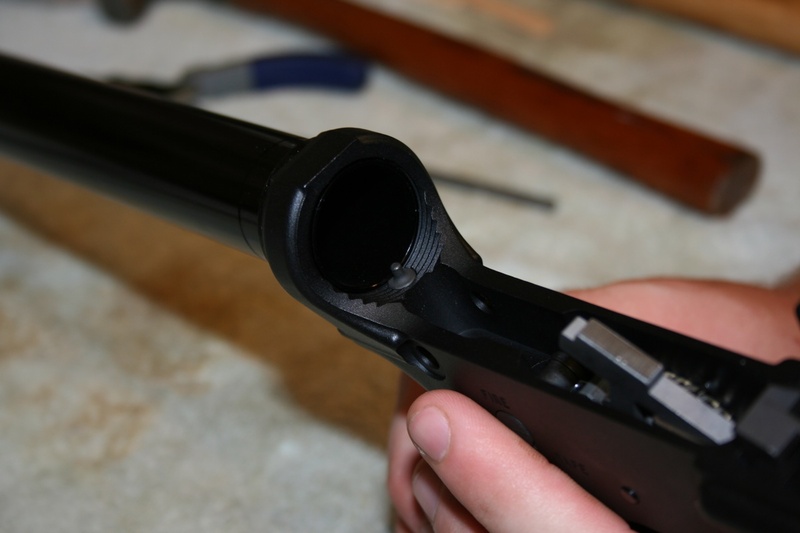 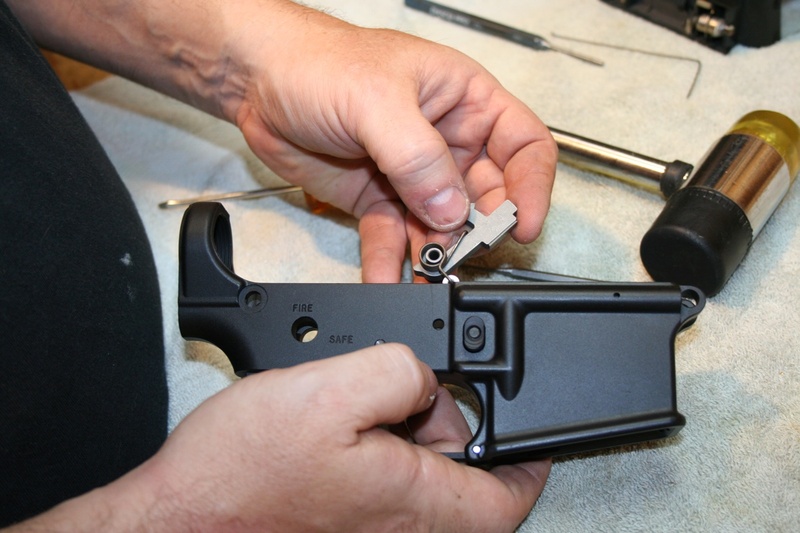 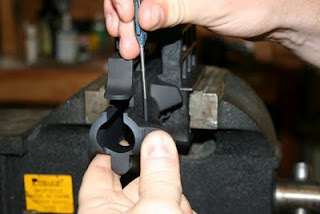 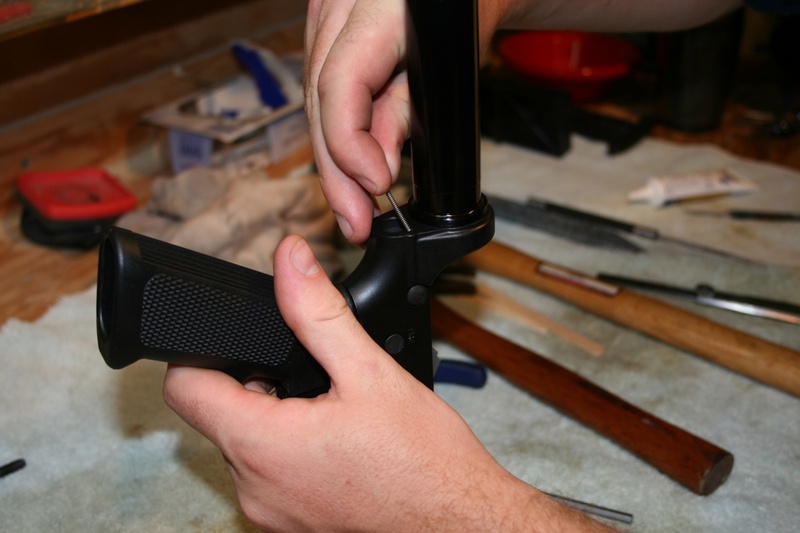 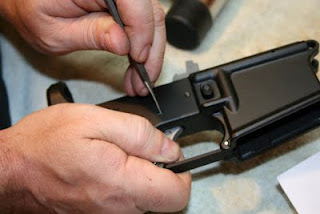 Next, push the opposite end of the trigger guard into the rear mounting ears and align the pin holes. 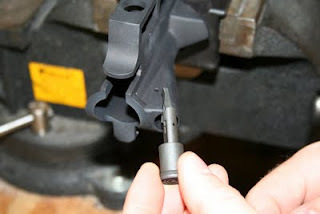 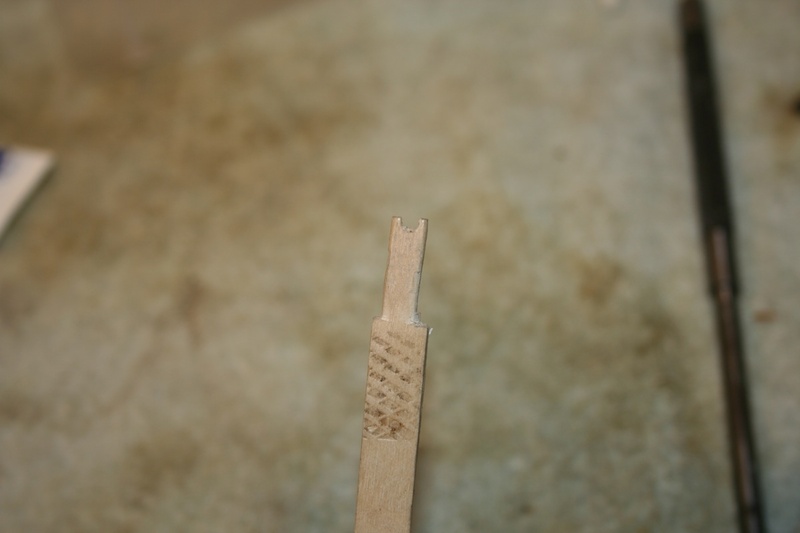 It doesn’t hurt anything to insert a small punch to line up the holes and keep them aligned while driving in the roll pin, but it isn’t really required. 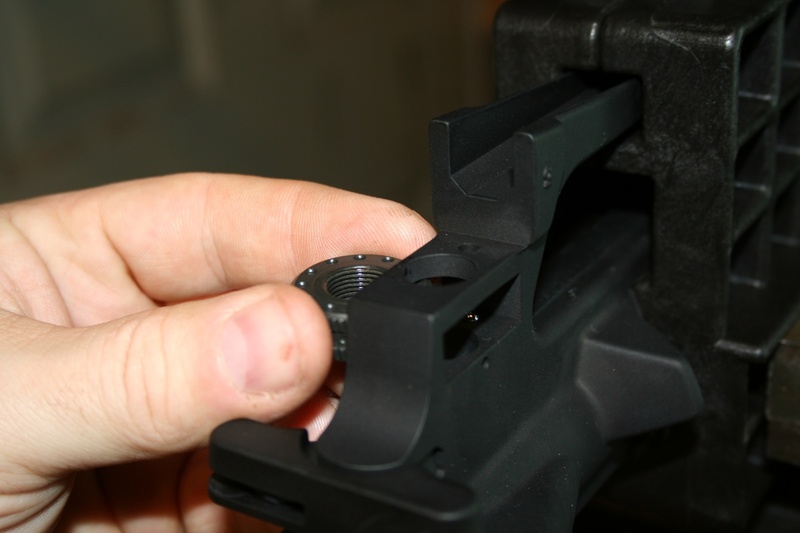 Drive the roll pin through the rear mounting ears and the trigger guard mounting hole. Next time, we’ll install and adjust the Jewell two stage match trigger.